While I was having a chinwag with our local bike dealer yesterday evening a rather strange contraption freewheeled onto the forecourt. A young man dismounted and proceeded to ask for a 20 inch inner tube, while I asked myself how he was going to get this machine to his destination, surely no further away than a few kilometres. But this is not all. 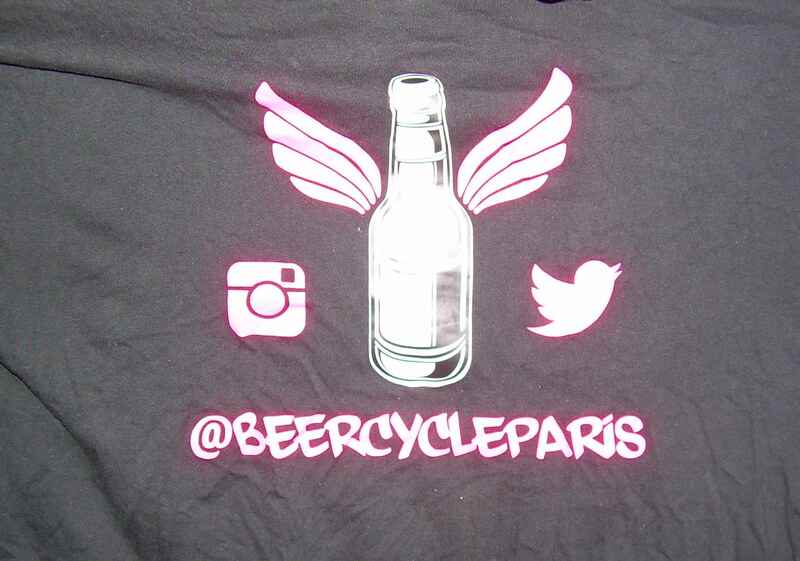 Jean Francois runs a small business selling Belgian beer in France, at festivals and similar events. 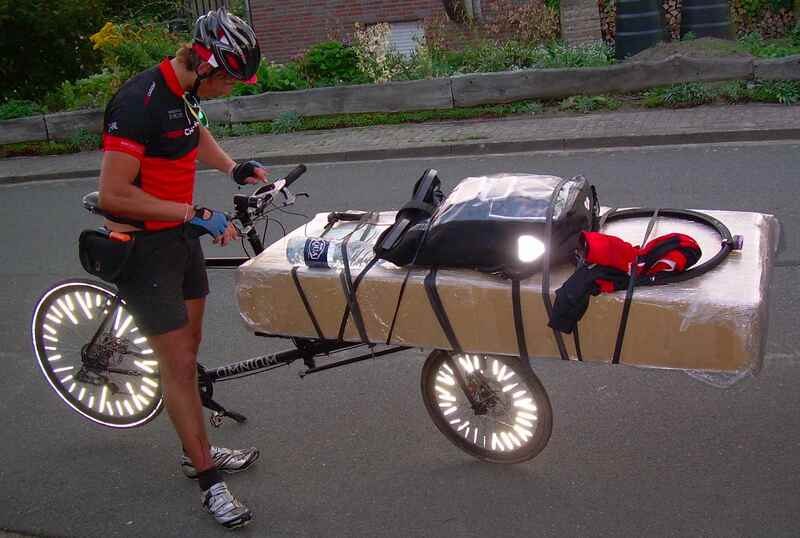 He imports the beer on his other carrier bike, admittedly sometimes with the assistance of the railway. It seems to be his specialty to ride day and night, while preferring nighttime because of the absence of motorized traffic. 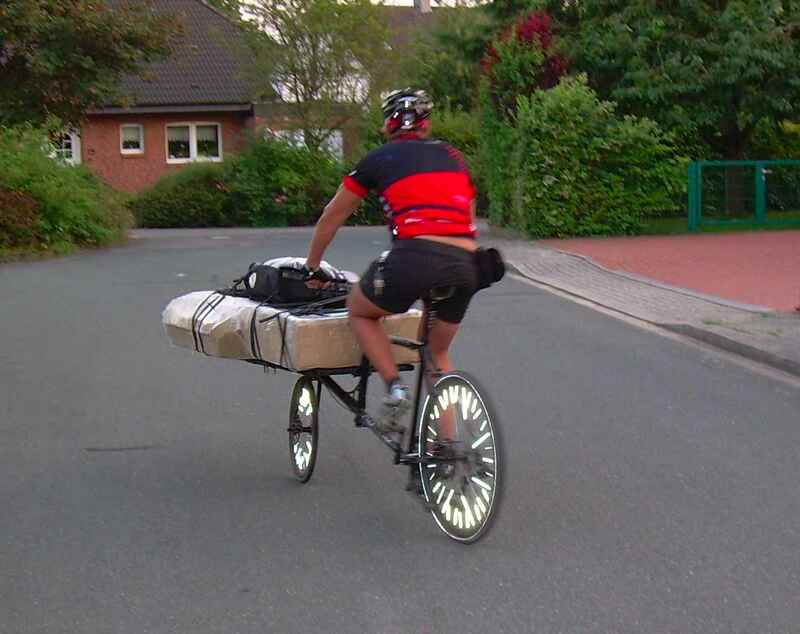 He thought that the Omnium carrier bike, steel framed, BTW, presents a good combination of lightweight running gear and heavy duty carrying capacity, so he got himself a couple, not at least because he takes part in a number of messenger bike races. 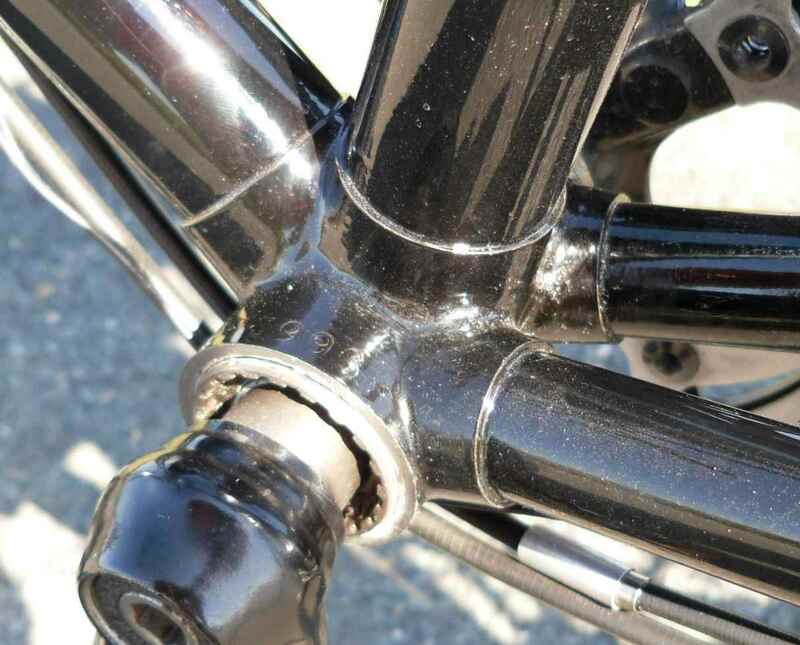 A well-broken in Brooks Pro which certainly didn´t come with the bike. 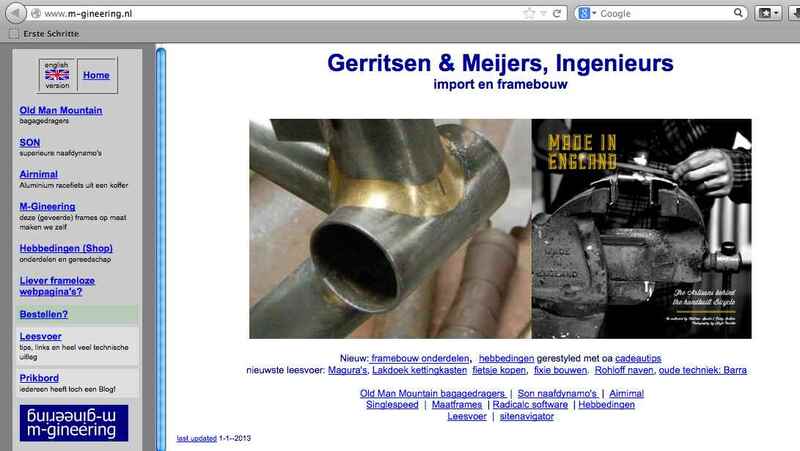 The frames are designed in Denmark, but made in Taiwan. They seem to be well made and thought out, and watching Jean-Francois riding along with his heavy load one can only say that it works. We rode to the next large electronics store to obtain a part for his GPS system, with the Omnium empty, and Jean-Francois remarked that it rides even better with some load on. If he says so it must be true as he knows how to ride a bike. 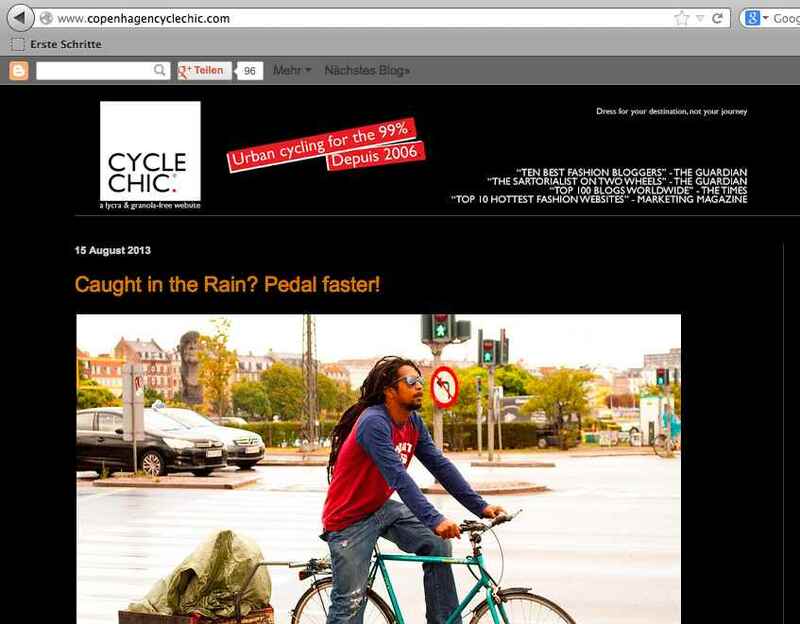 He built his Omnium up himself in Copenhagen and raced it the next day to place highly in a Copenhagen cycle messenger race. 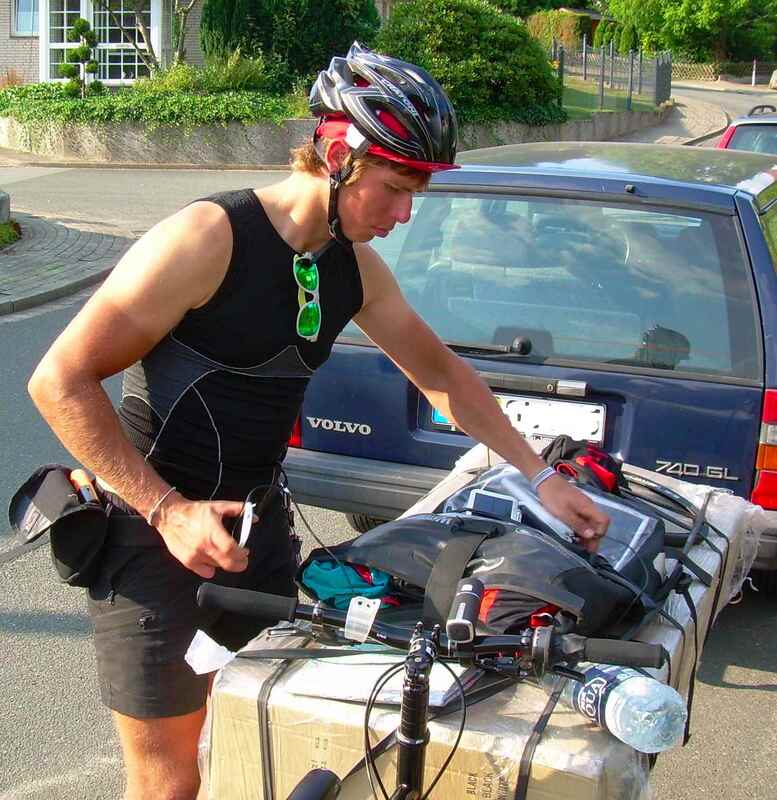 So after hooking up the newly bought external accumulator to his GPS system and after a light refreshment Jean-Francois disappeared into the night for the remaining 550 or so kilometres to Paris, leaving a feeling of envy at his cycling prowess. It certainly was a privilege to have met him. There was no 28 x 451 inner tube available for miles around, by the way. The man walking in front of me through the narrow aisles in a large shed filled with machinery lifts up his arms and says, “Yes, all the frames you see here have been made by these hands.” He says it with a quiet pride which comes from being at one with what you do, and knowing your trade inside out. After 38 km of enjoyable cycling I arrive at my destination, one of the very few remaining bicycle factories in the Bielefeld/Germany area. The building is wholly unspectacular, reminding me of the Taylor brothers´ Green Shed in Stockton in its stance of being all contents and no flashiness. Two small children are playing in the forecourt in the sunshine, the owner´s as it turns out, riding bikes with their name on, which is something for a kid, I guess. Soon I´m greeted by Herr Krüger, owner and frame builder of KFS: Krüger Fahrradrahmenbau Spenge. 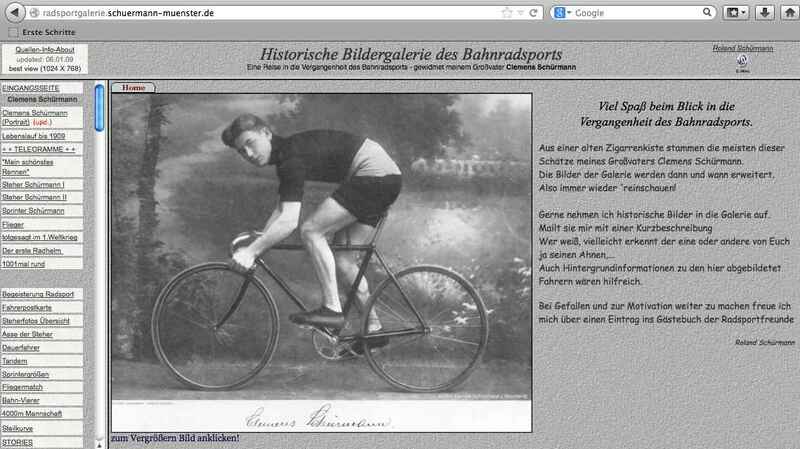 The bicycle which has gotten me here has a KFS frame, and Michael Krüger eyes it with interest. 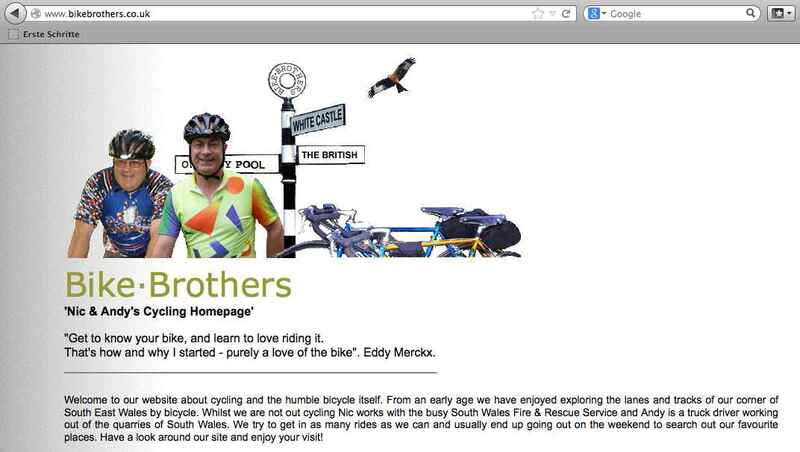 It´s obviously not just another item which at some stage passed through the KFS works; one feels right away that the man you talk to lives bikes. 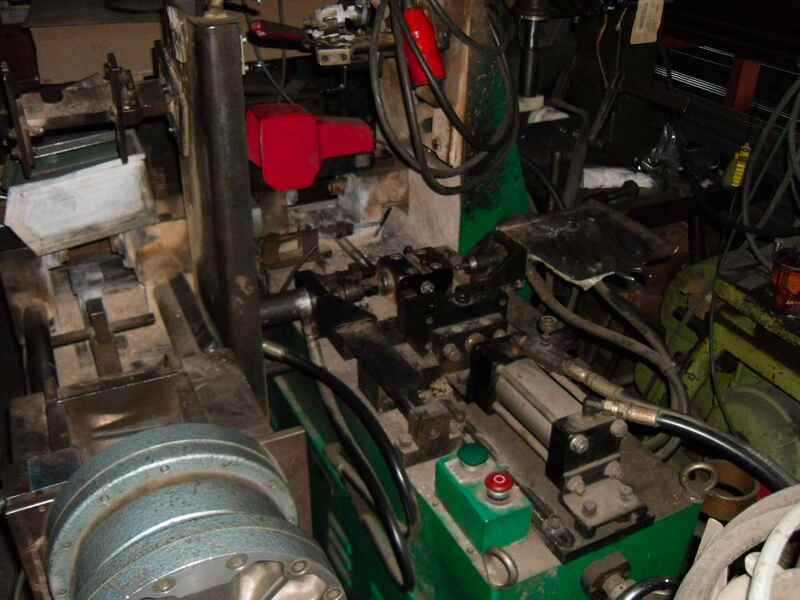 The small factory looks cluttered, but when all the machinery is explained to you it becomes clear that the building is laid out precisely to enable the man making the frames to work as economically as possible. 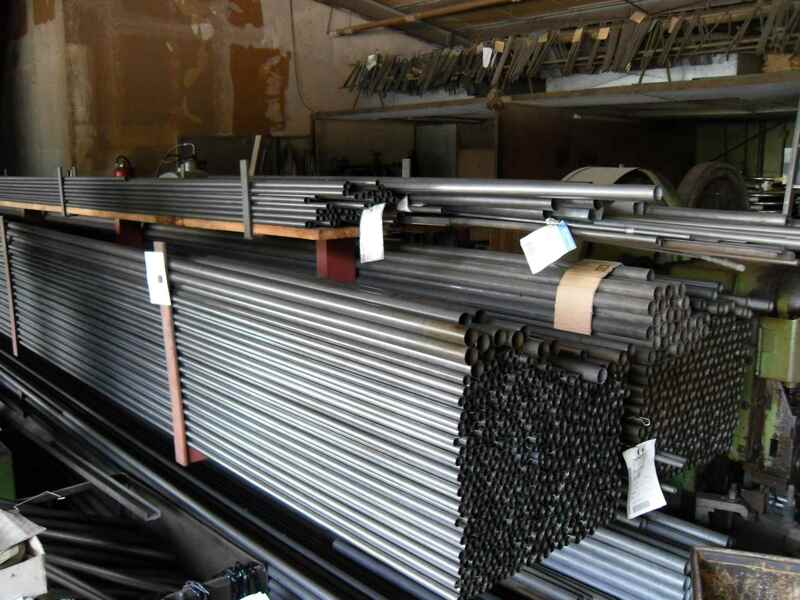 Stacks of frame subassemblies are everywhere, but there are no shop or outlet facilities. 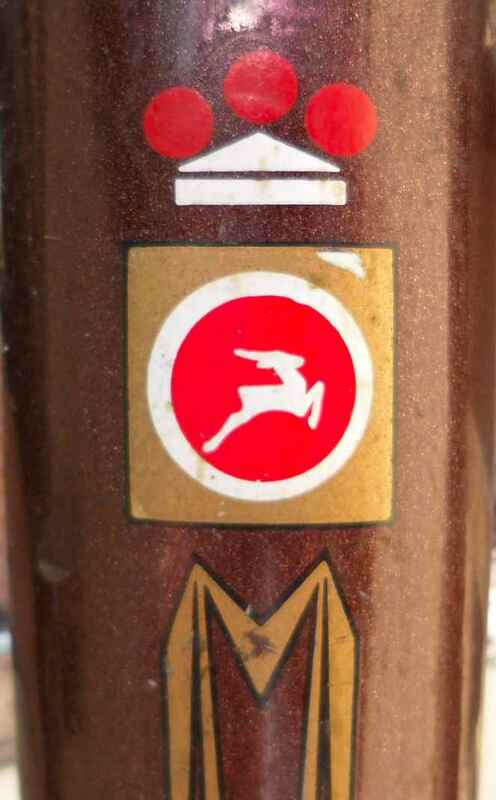 So when Quitmann Bicycles state on their website that their frames are made in Westphalia in the traditional way, having a lineage down to Miele and other famous brands, this has a lot of truth in it as we shall see later. And, still more fascinating, all of the machines in the workshop, big and small, have their histories, inside KFS and outside, which is remembered sometimes with pride, sometimes with a smile, depending on what it is and where it came from. It took Michael´s father quite some time and energy to be able to buy this big milling and honing machine, for instance, but it facilitates the production process greatly. 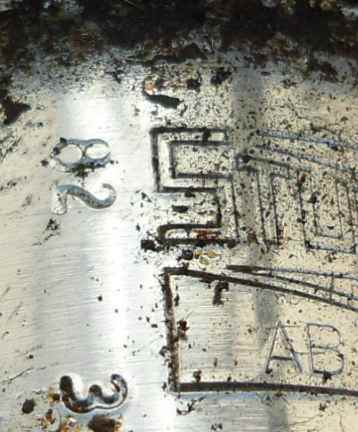 It was not only used by Miele, but actually made by them too. 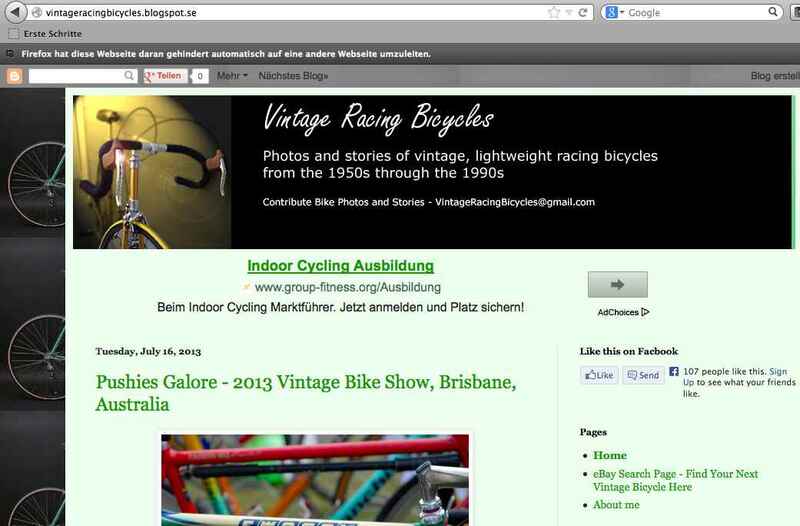 This is where Quitmann riders get their bike´s lineage from, although I doubt they know it´s as direct as this. 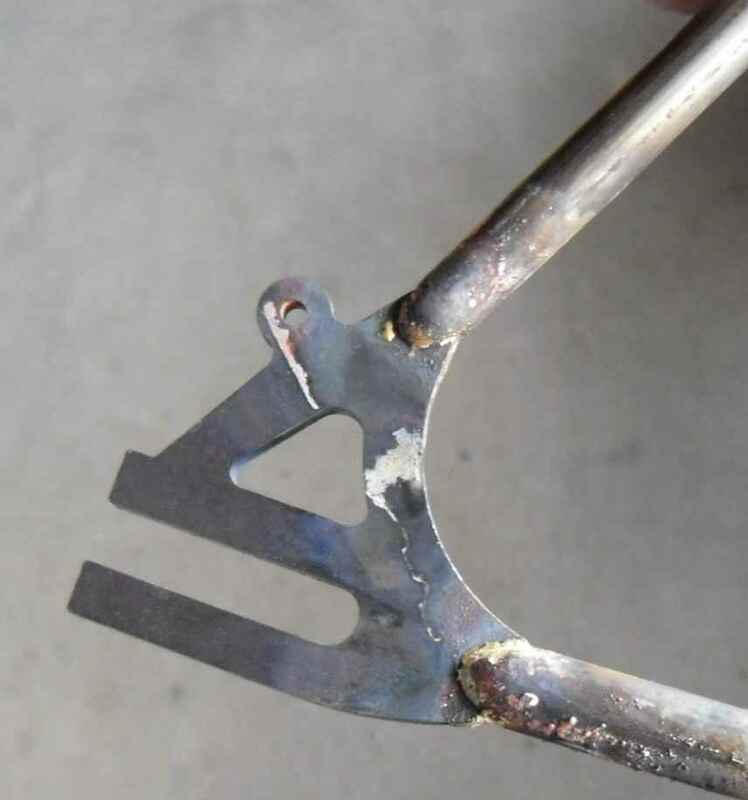 Another example is this brazing stand foot. 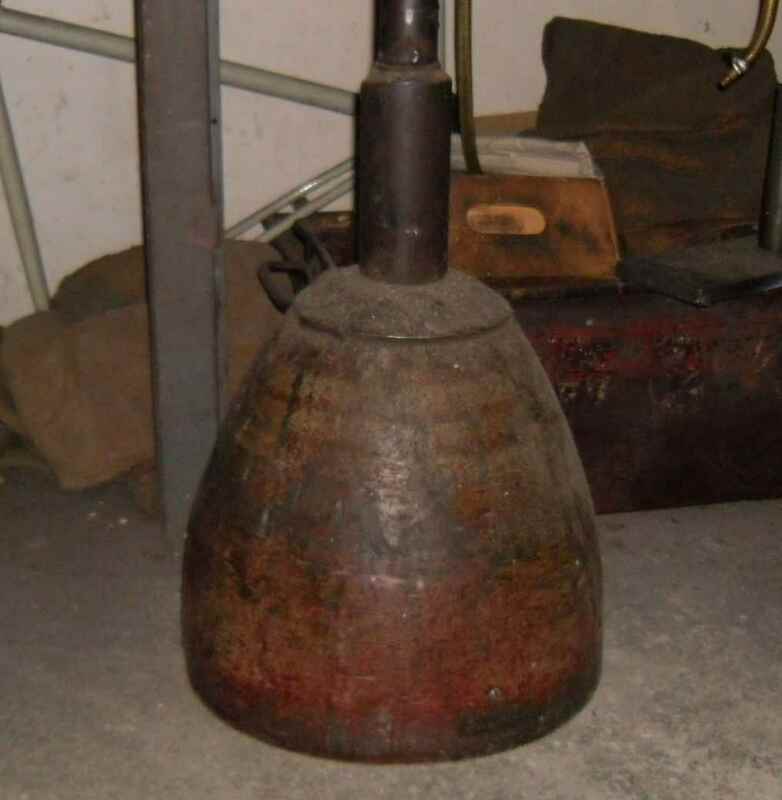 It was obtained from the Rixe works when they closed down, and the legend goes that it was a left over bomb shell tip from WWII, filled with concrete. 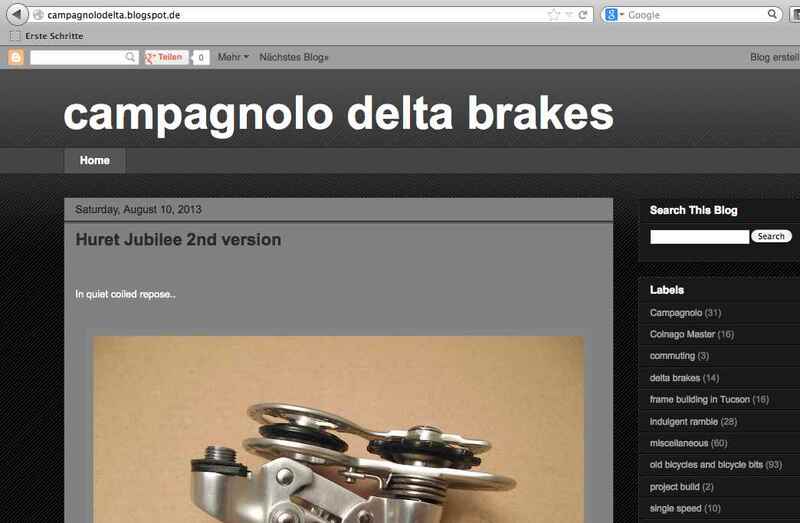 When KFS was founded by Herr Krüger´s father in 1967, most German bicycle makers were in dire straits, or had actually already gone out of business, like Dürkopp or Miele. Consequently, an astute businessman could snap up all sorts of machinery and equipment. I am told that this cart came from the Westerheide factory, that machine from Rixe, or indeed the big four station milling machine from Miele. 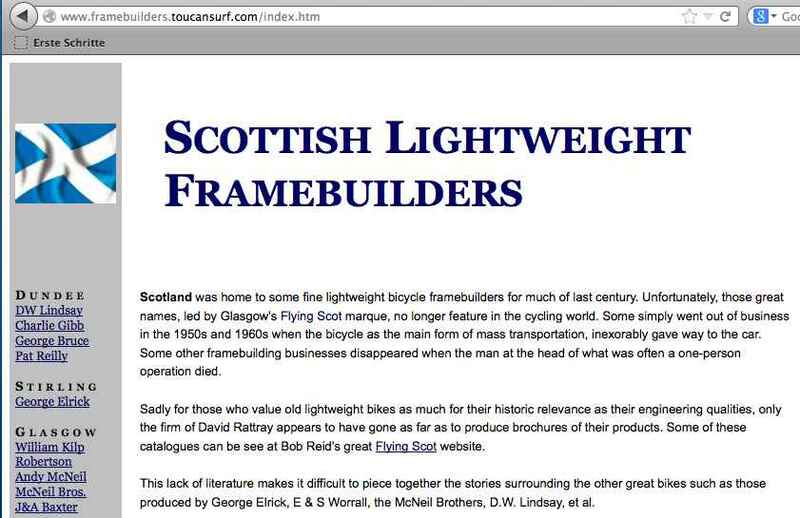 KFS at the time executed all sorts of metalwork for the cycle industry as they still do today and turned to fully fledged framebuilding only later. 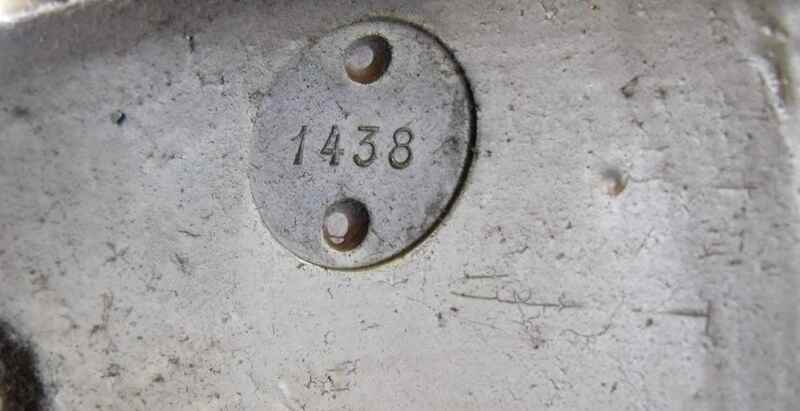 An aligning table used to straighten frames after brazing. 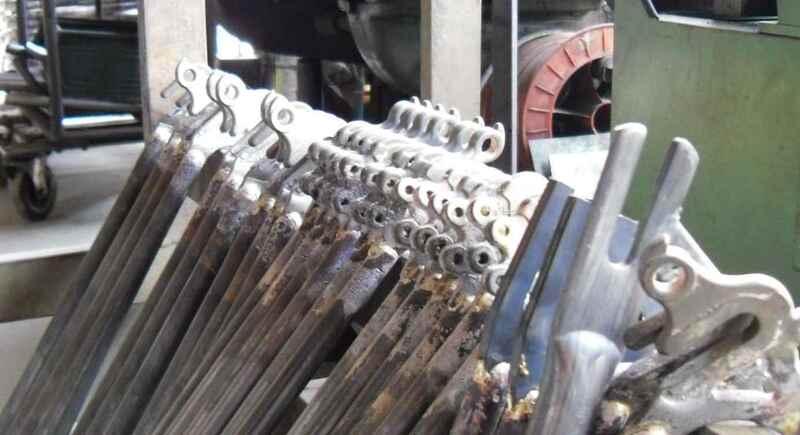 A machine which holds parts together pneumatically while they are being brazed. 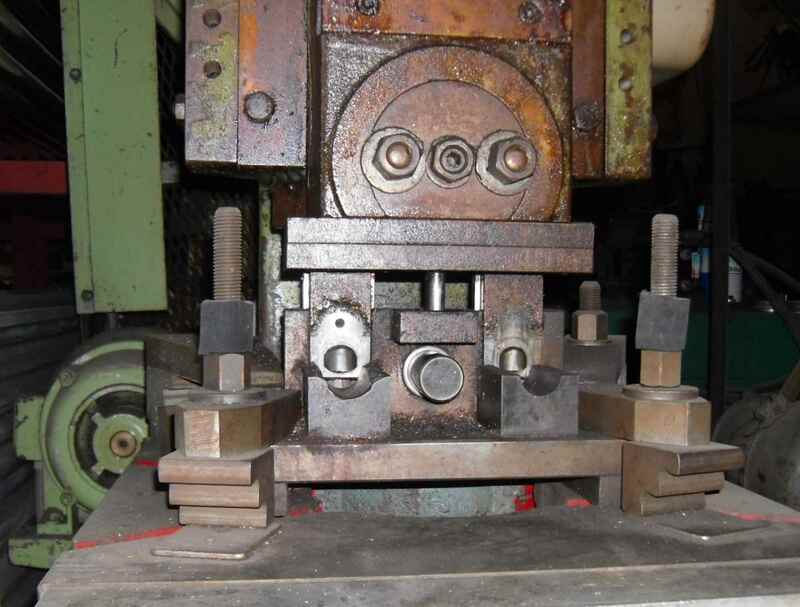 A mitering machine with an additional set of tools for differing tubing diameters (top). 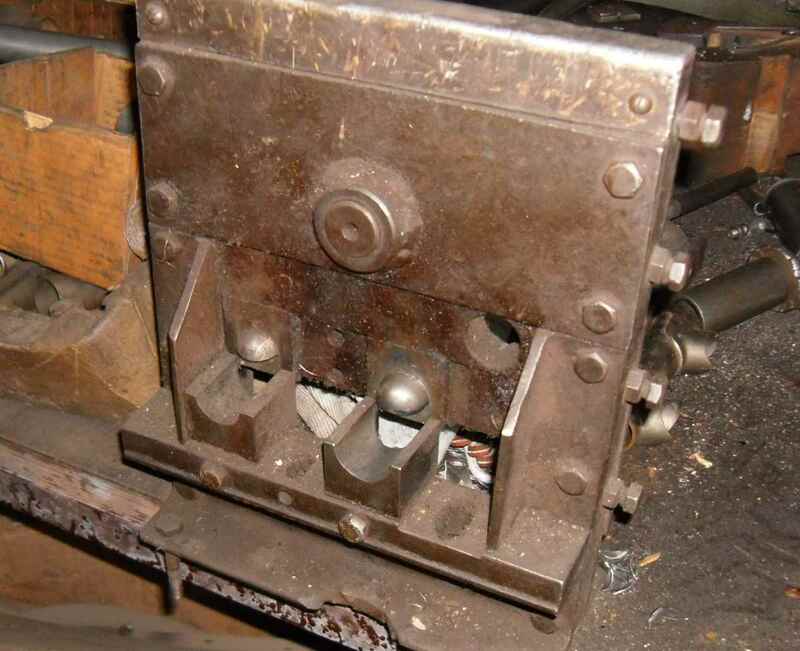 A machine used to press frame parts together. 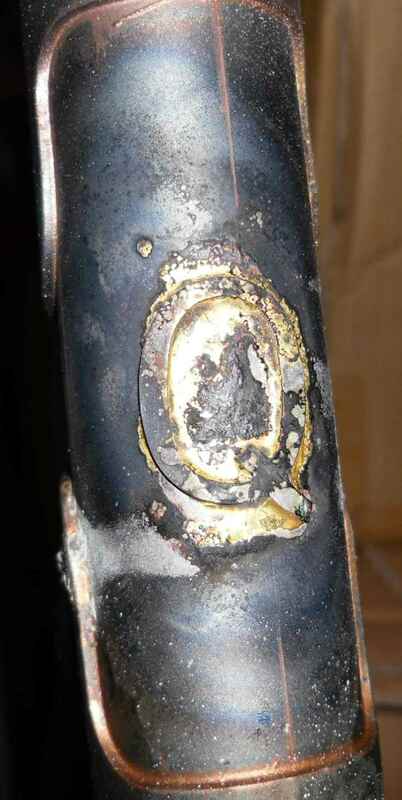 They will not fall apart when taken to be brazed. 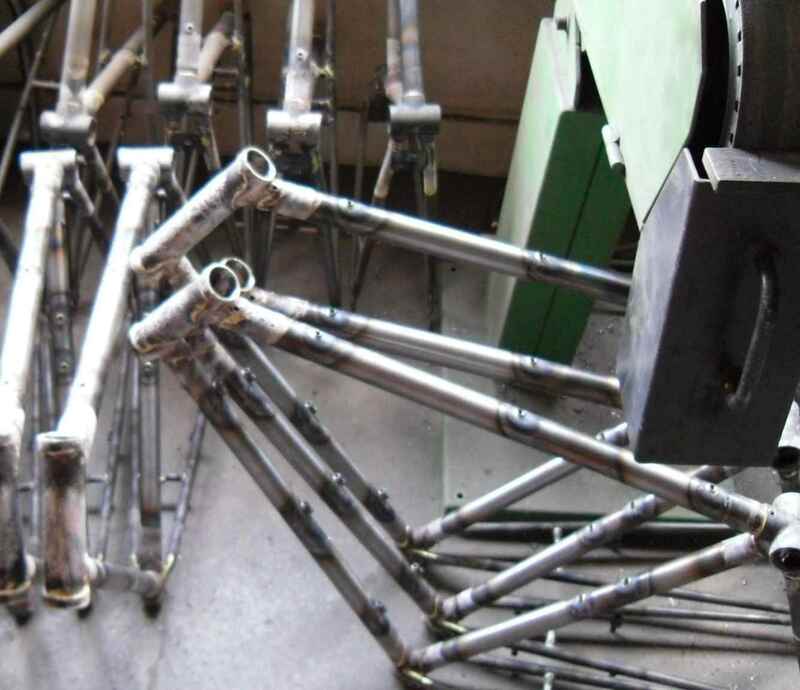 Next I am shown ready brazed frames and subassemblies. This also showcases the range KFS are able to produce. 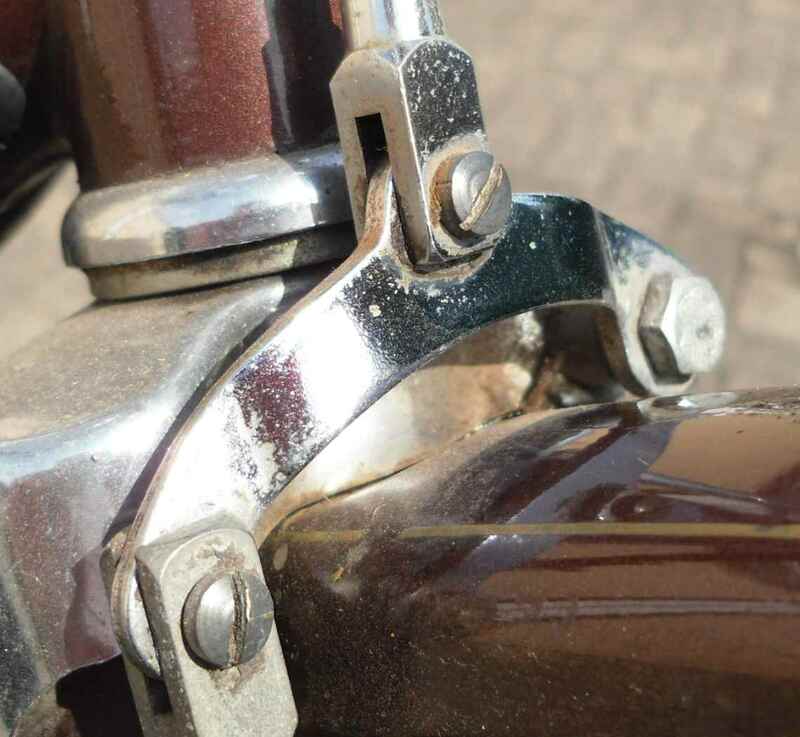 Where applicable KFS bend most tubes themselves, but for some, like Dutch roadster bike rear triangles, one needs expensive equipment so these parts are bought in from a firm in neighbouring Herford who also used to make the self same triangles for Gazelle, for instance. 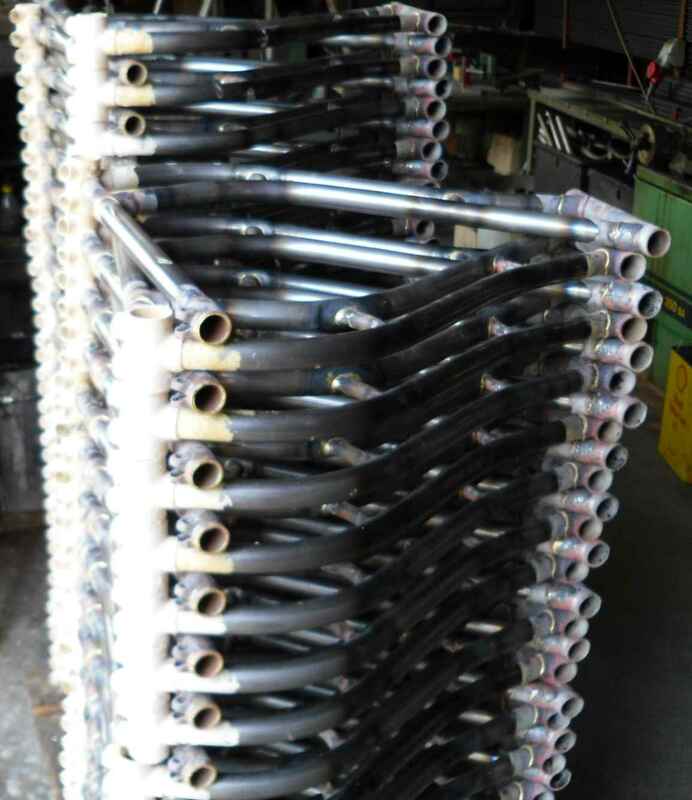 Also all front forks are bought in, many from specialised firms in Taiwan, because they have the equipment to produce the multitude of shapes demanded by customers. Of late KFS have been experimenting with a made to order laser cut rear facing dropout end, not only to cater for the fixie crowd, but also for high quality traditional frames equipped with coaster braked geared hubs, which still have a large following in Germany. 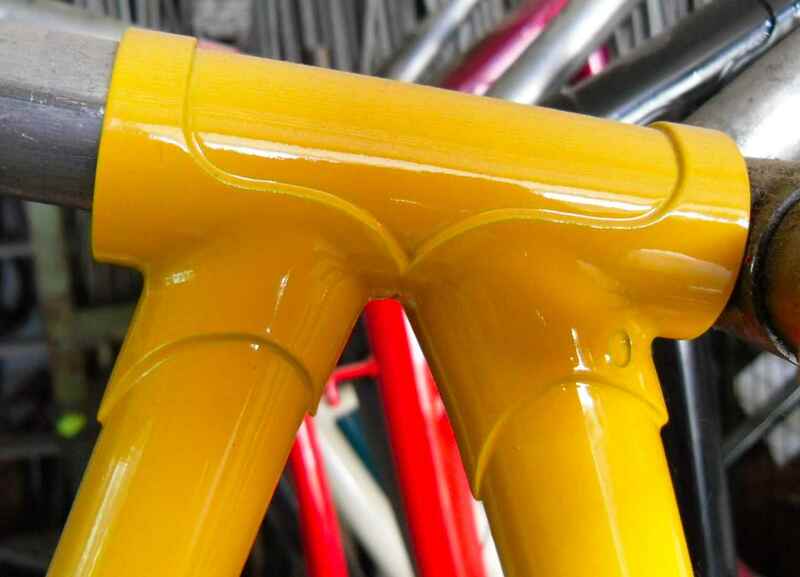 Those frames will have fully brazed rear triangles, as opposed to part welded ones used by the competition. And this is what all these frames are made of: Tubing ranging from cheap seemed to high end, depending on the price point of the end product. 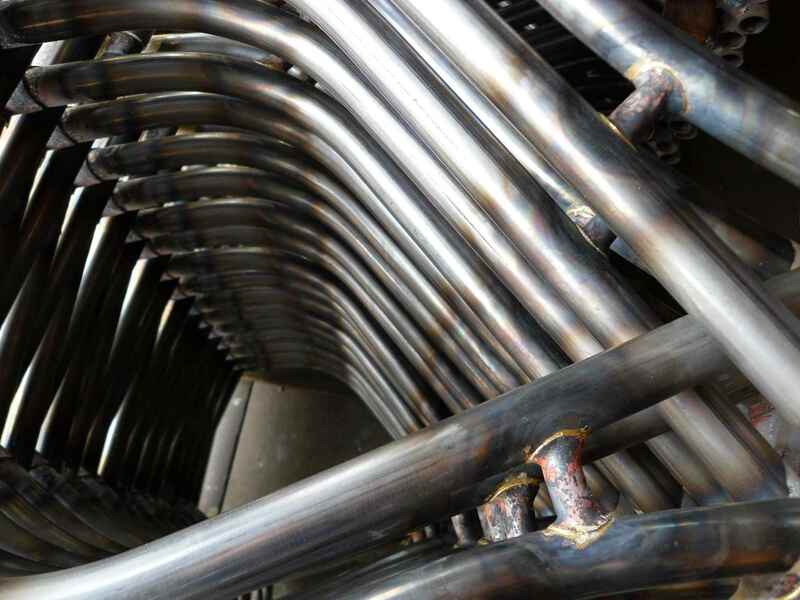 Most of the tubing is supplied by Poppe und Potthoff (P&P) in neighbouring Werther. 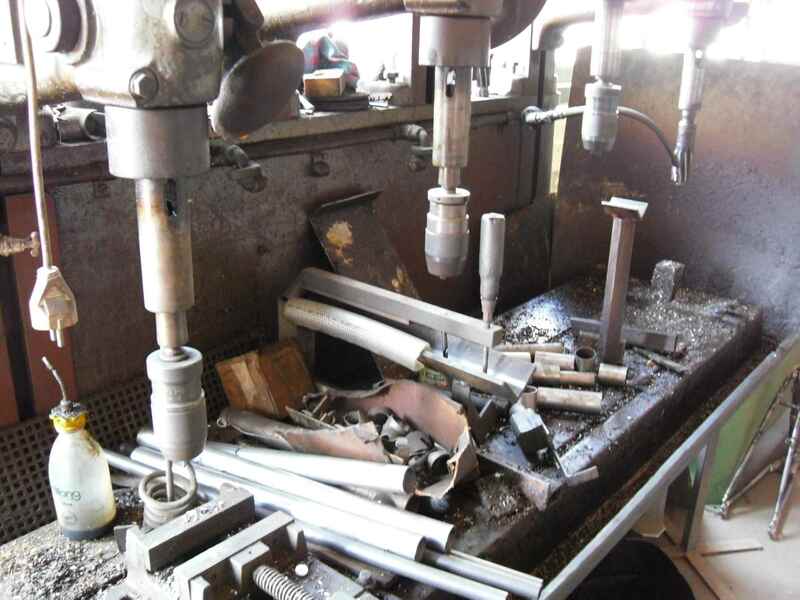 After having made the round of the frame building part of the business we have a look at the shotblasting and painting facilities. 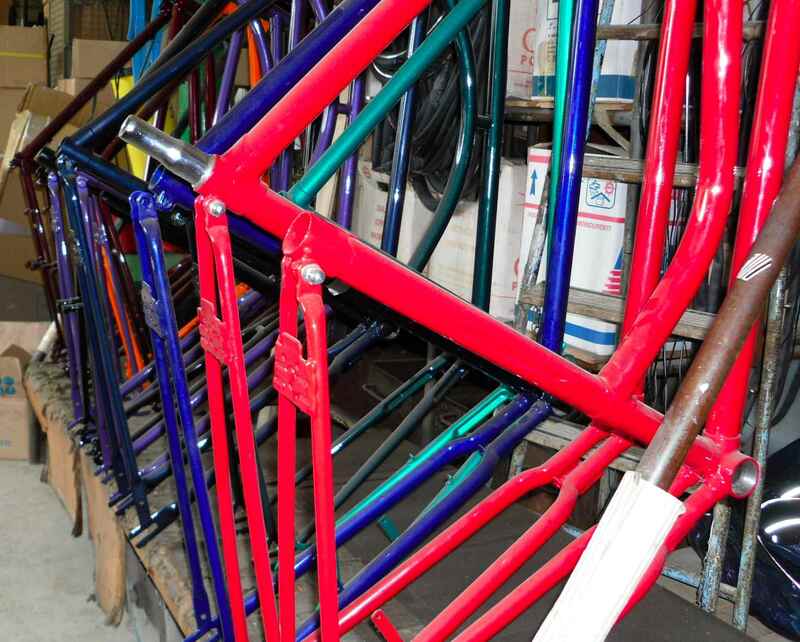 KFS employ a mix of painting and power coating (clear coat) on each frame. 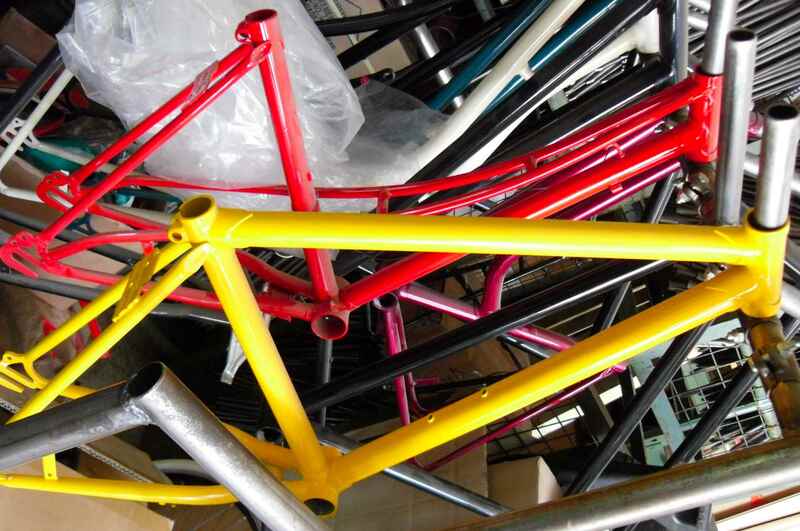 Colours are to choice, of course, so there are some colourful views in the factory. The two frames in this picture are for Herr Krüger´s children. There are always a number of demonstrators for trade fairs or visiting customers at hand. 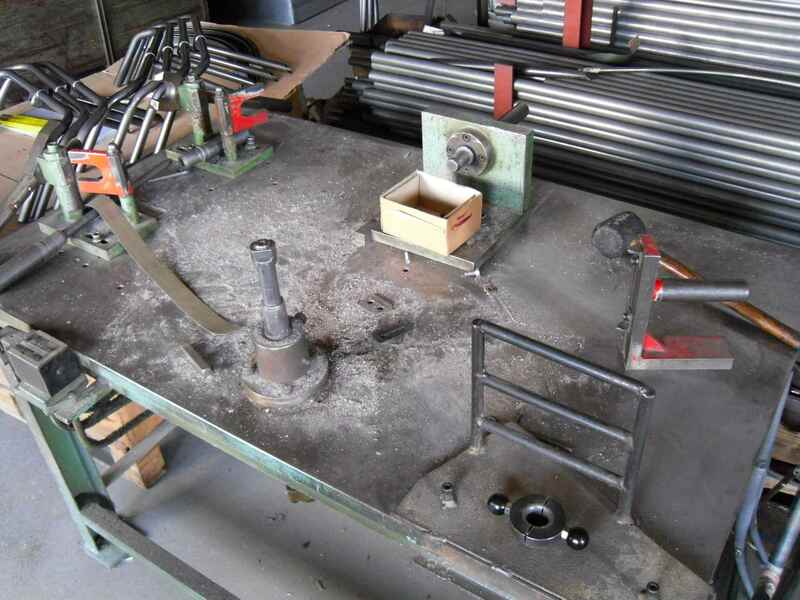 After about an hour Herr Krüger had to carry on with his work, but he invited me to return during the winter season when there would be more time, and also to come on a day on which he will be brazing, so hopefully there will be more on KFS including some spectacular photos. I´m looking forward to see more live tradition at work. Dou you have bikes you feel you neglect? Not by leaving them outside for years, or just wearing them out on daily trips to the rail station, but simply by not giving them the attention they merit? This is the bike which gives me a bad conscience, not least because I haven´t invested much time in its upkeep, so I hope readers will excuse the somewhat shopsoiled state the bike is in. Some years ago I found it quite by chance. It is a Gazelle Impala made in or about 1982. It is my size, and it was cheap, as second hand bikes often are in Holland. Not only did I get it because even then those old school Impalas were getting scarce, but I had thought about morphing a slow, sturdy bike into something more racy for some time. 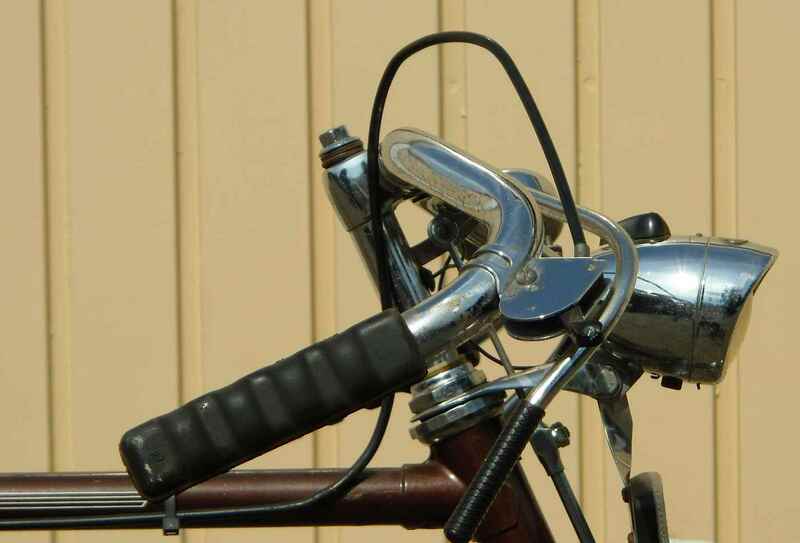 I had found a pair of handlebars which must be Gazelle judging from their details but which I had never seen before, and an old French front carrier which would make a great saddle bag support. 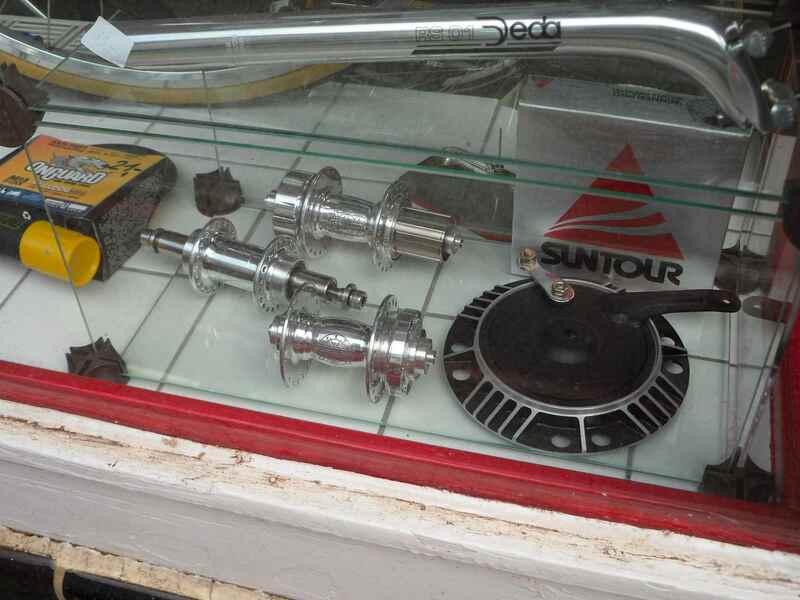 Only the fitting bike was missing, but that changed when I returned from a meet in Holland and, as it is my habit, went into a cycle dealer´s I had chanced upon on the way. The loft was choc a block with used bikes, and I had to convince the chap that I really wanted the one furthest away from us. “Geen proefrit“, no trial ride, the man said, “I´m not putting the bike back. 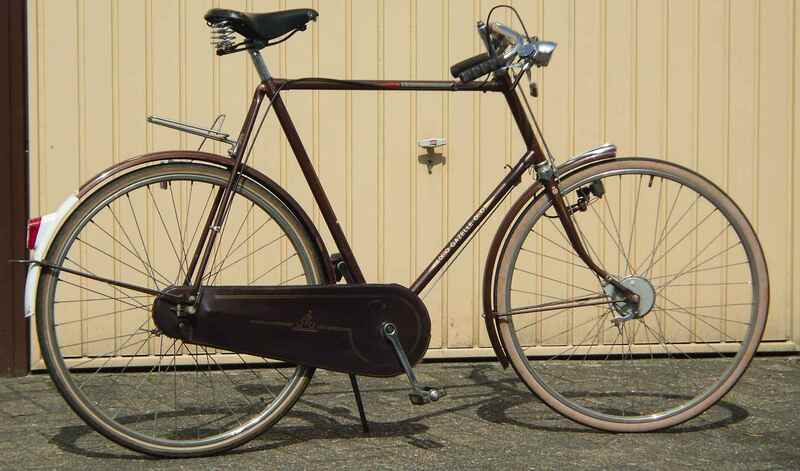 I take it out, you buy it.” I didn´t need a proefrit; I knew I wanted the bike regardless of its condition. The frame was straight, I had seen that, and that was sufficient. In a general overview the bike looks rather British, and that was my intention. 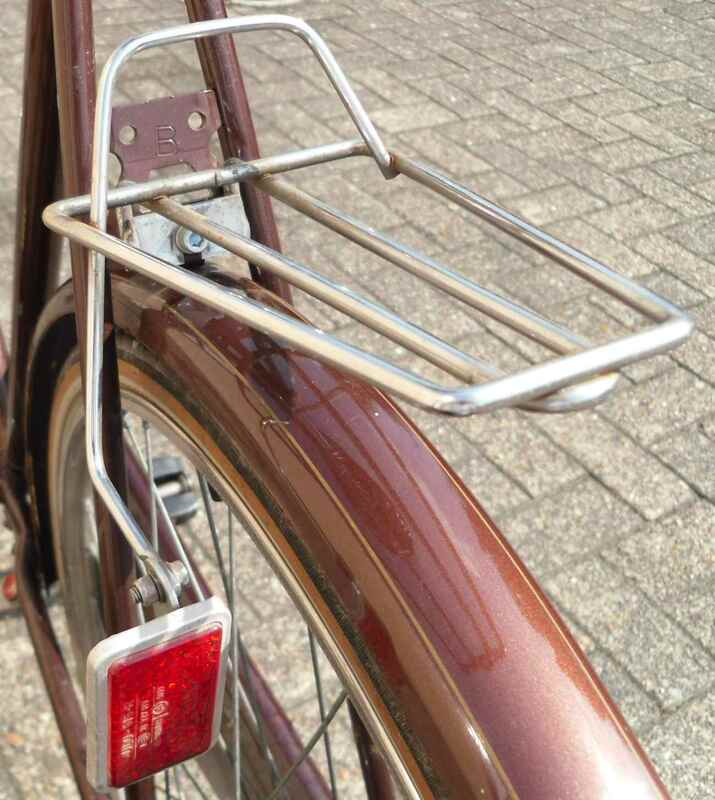 North Road bars with brake rods, however, are not to be found frequently, especially not when they fit Gazelle measurements and have the typical Gazelle lighting wire exit in the stem. 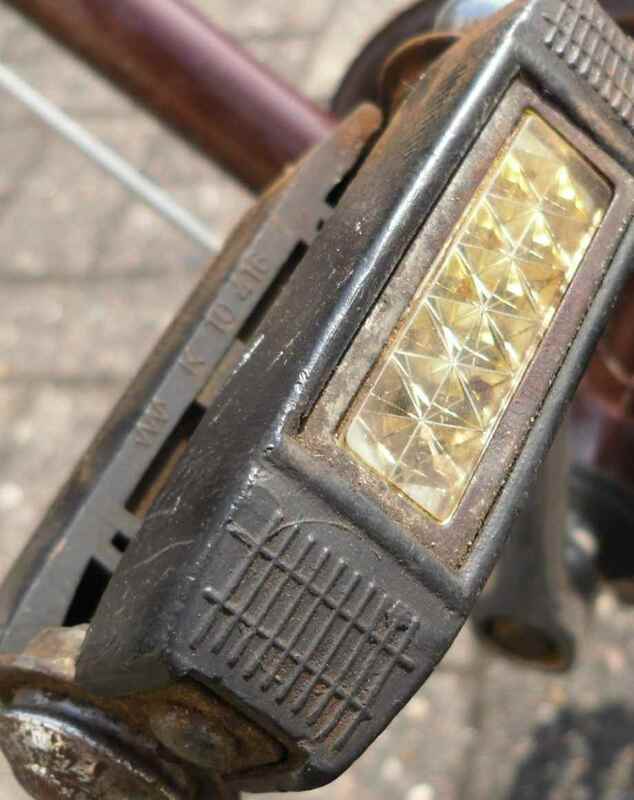 This is where the rear light cable enters the frame. 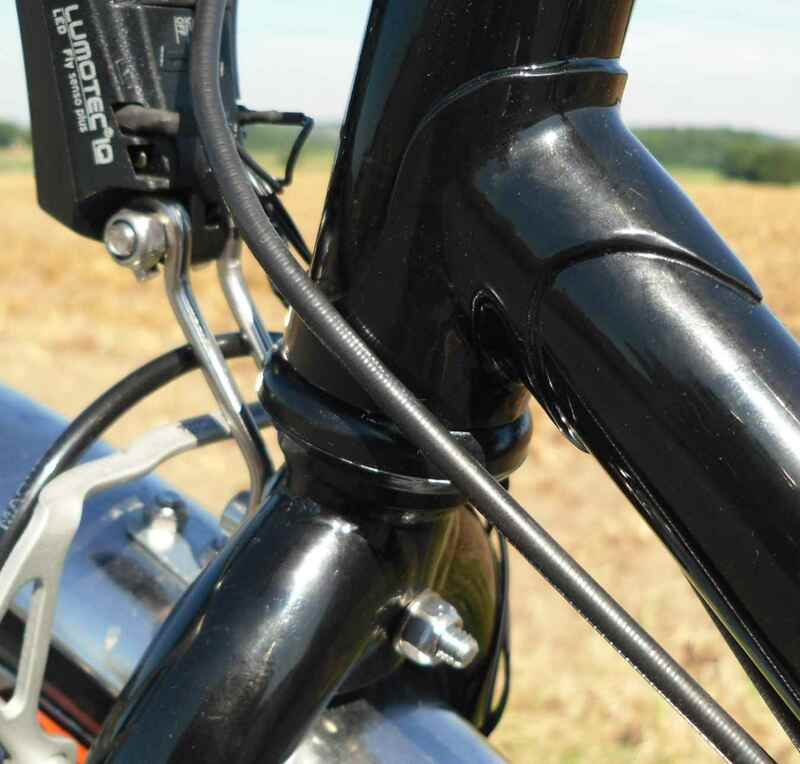 Here´s a side view of those great handlebars. And, would you believe it, they are quite comfortable too. 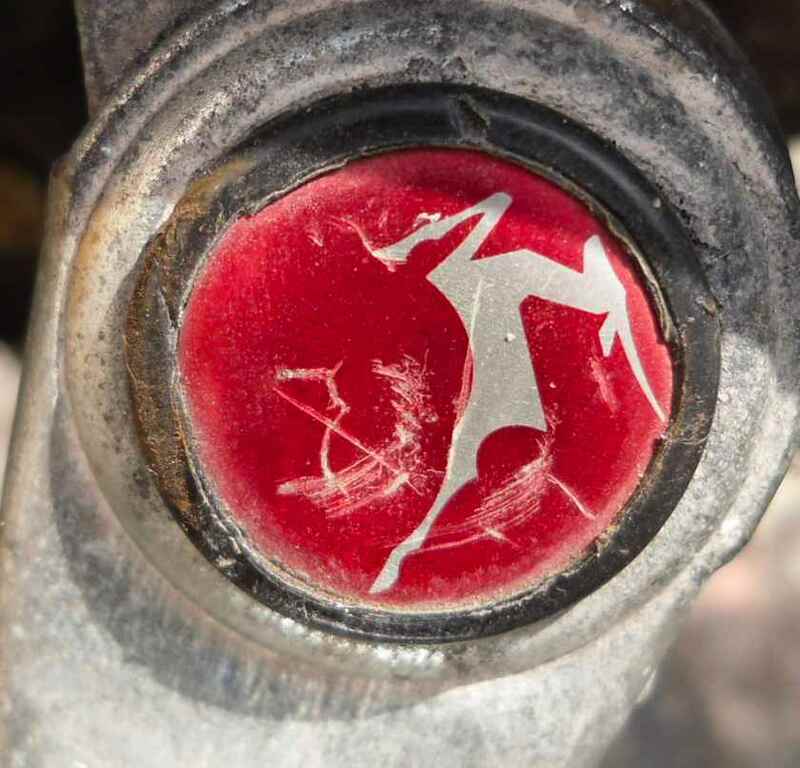 It´s hard enough to miss that you´re looking at a bicycle from the famous Dieren stable, but scrutinizing it more closely reveals a number of still more unmistakable details. It also becomes clear that the bike had had a hard life before I rescued it. Where´s the animal on the photo above? 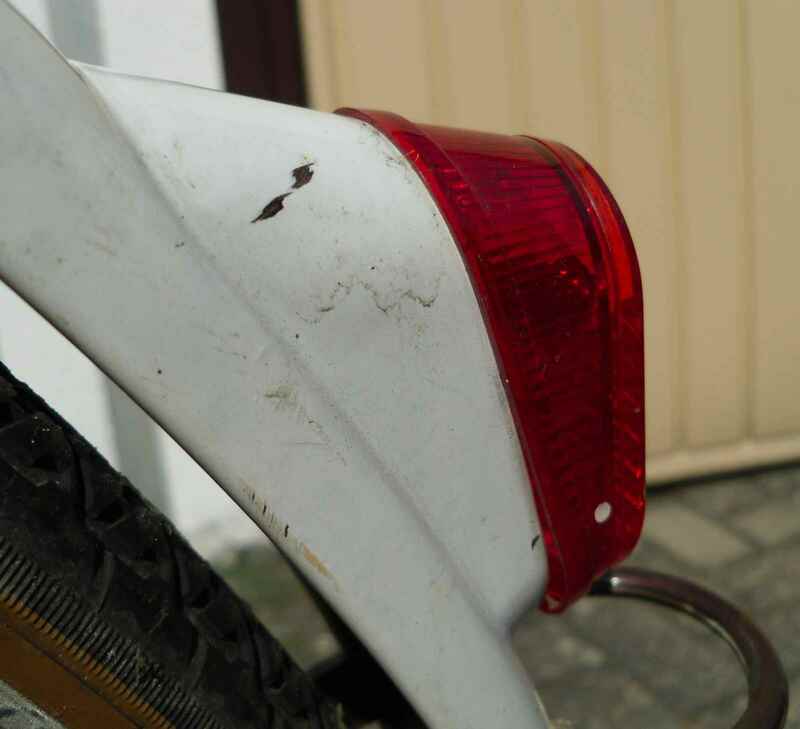 Well, there is none, but the integrated rear light was another unmistakable feature of higher price point Gazelles, the smaller one depicted here having been introduced in the seventies, if I´m not mistaken. This is the old French front carrier which I turned into a saddle bag support, and it works quite well too. The wayward reflector looks abit out of place, but it sits where the headlight originally would have. Old pair of pedals I substituted the worn pair with. Some more nice transfers. I can´t easily put a period to this design, it is typically Gazelle bike and nothing else, really, but difinitively not run of the mill seventies. 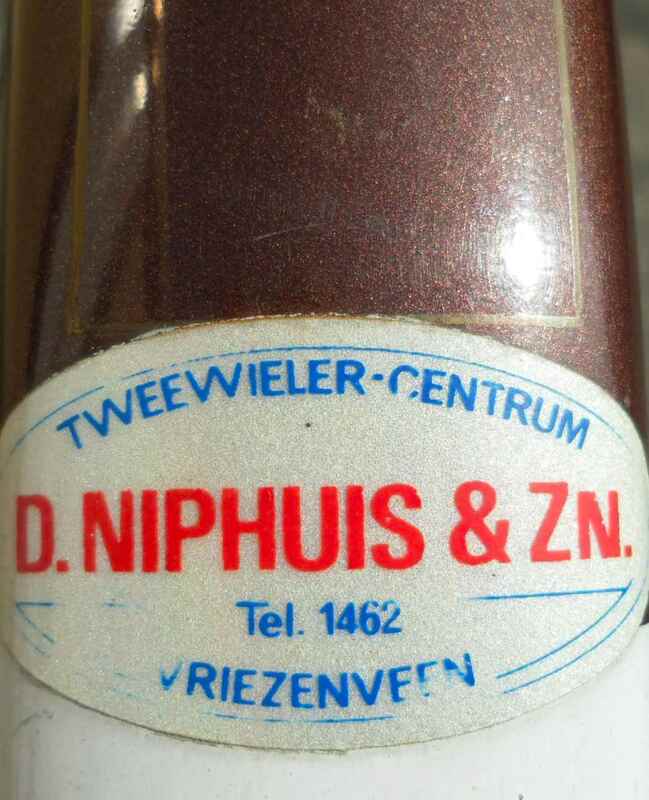 The nice sticker from the original dealer; red, white and blue like the Dutch flag. The shop still exists, albeit with a different phone number. It was not the dealer I bought the bike of. 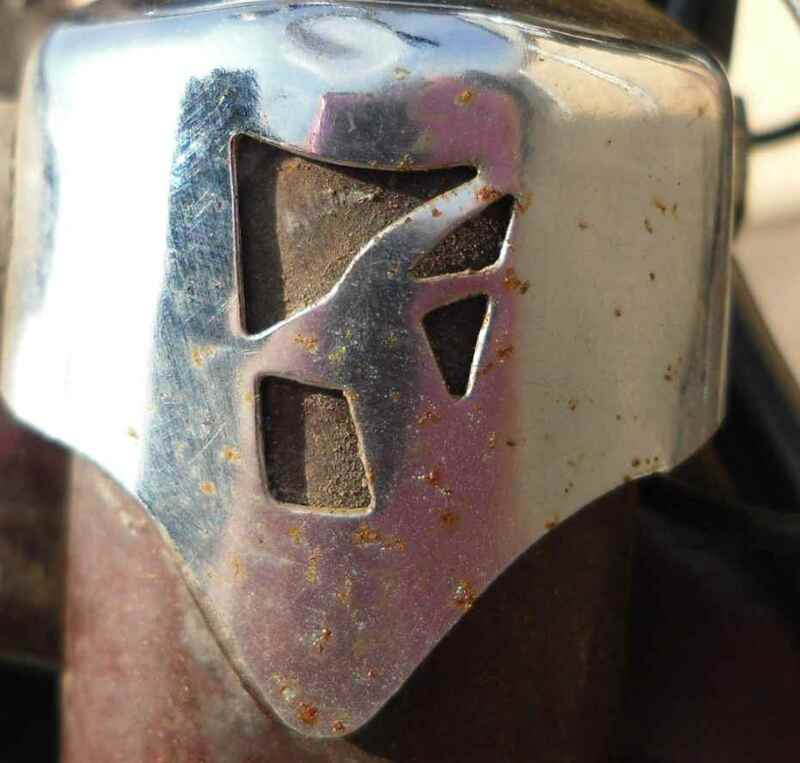 A detail from the fabric chainguard. Not sure if it´s the original one. 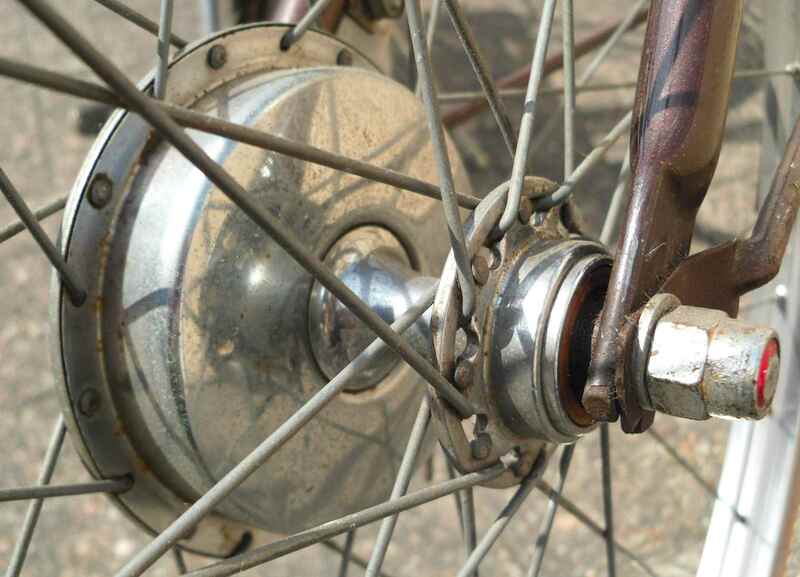 The Gazelle front drum brake hub, taking Sturmey brake shoes, but using annular bearings which definitively is not Sturmey. 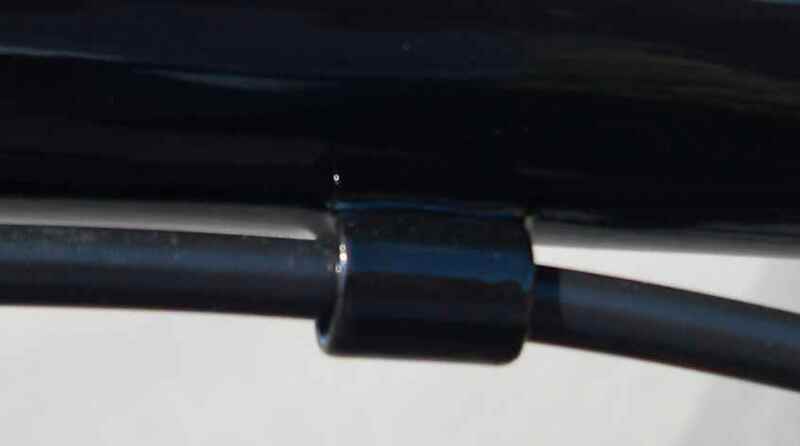 A brake rod link. 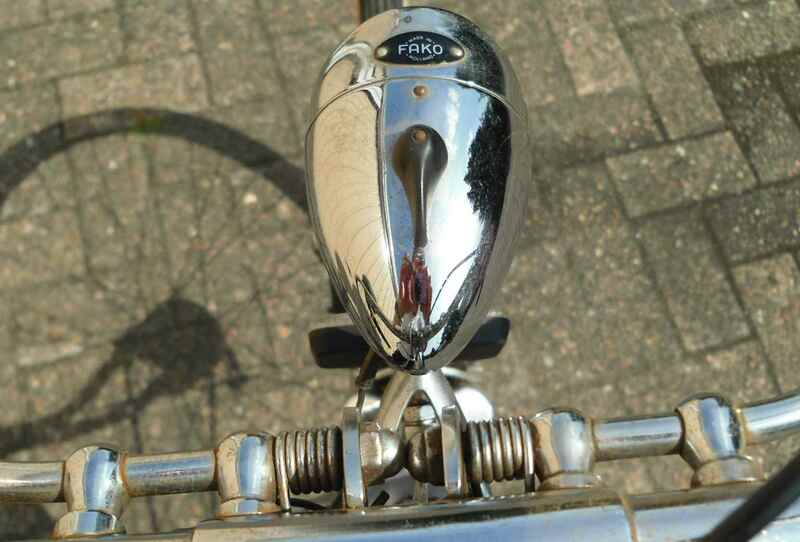 I know, I should polish the wonderful chrome properly, but have you even taken a fully equipped Dutch roadster bike to bits, cleaned everything and reassembled it? It takes ages. The IKU dynamo. Minute, but lightweight, doesn´t create too much drag and gives good, reliable power. Used to be my favourites in the eighties. 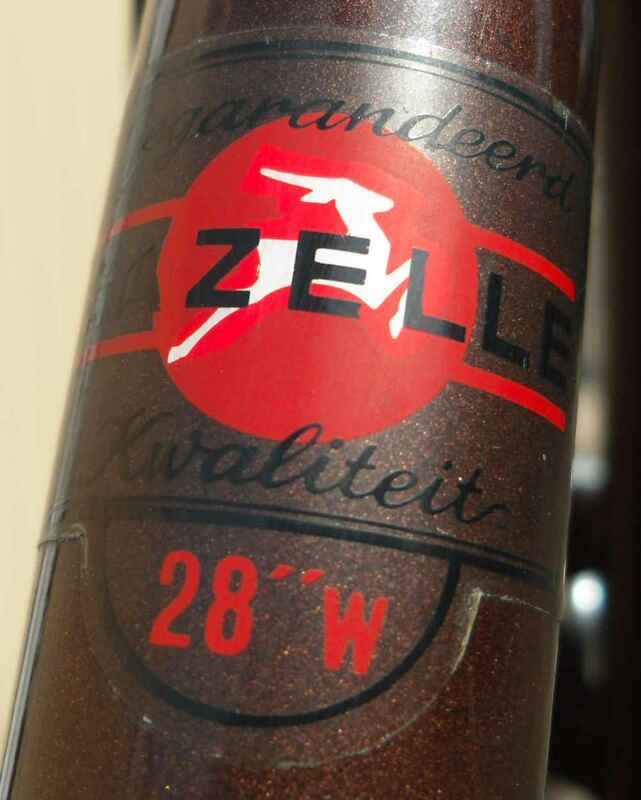 Another Gazelle specialty: the “kogellager”, mentioned on a sticker on the seat tube, meaning the bottom bracket bearing uses annular bearings. Hard wearing, once worn easy to change if you know what you´re doing. Not Gazelle, but a nice touch nevertheless. The rims are stainless, btw. Lastly, a view onto the cockpit. The headlight was my doing, I just couldn´t resist the old fashioned high/low beam system in the contemporary looking shell. And it´s Dutch, too. Yeah, it´s not straight, I know. I really must clean it up and ride this beauty more. 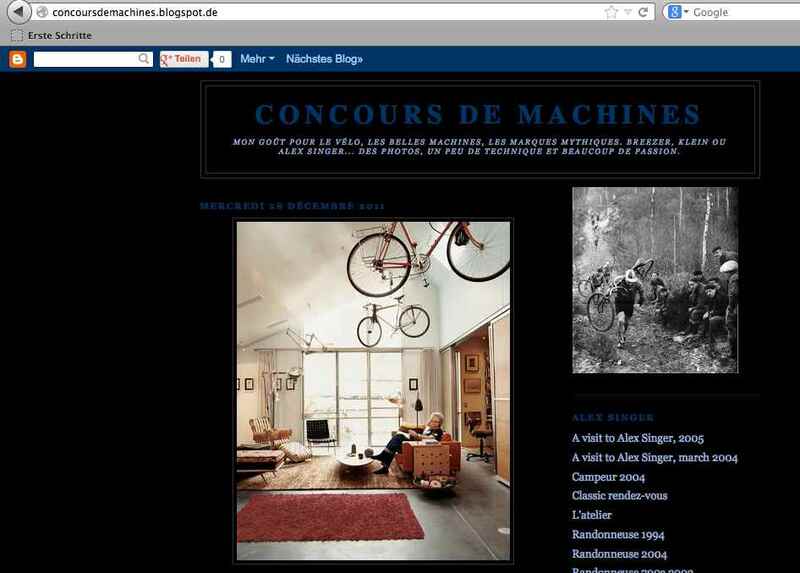 Last October I started to put the German bike supply system to a test. Our local bike shop had had the opportunity to sell two seriously expensive electrically assisted bikes which are all the rage over here (and many of which have been tested as life endangering failures by the German equivalent of “Which?” magazine, btw) under the proviso that they´d accept a very strange bike in part exchange, so they did, luckily for me. The very strange bike was equipped with a Rohloff 14sp hub, Magura HS33 brakes, a rather nice Shimano/Busch und Müller lighting combo and some other useful stuff. So what was strange about that? That it still was a cheapo. 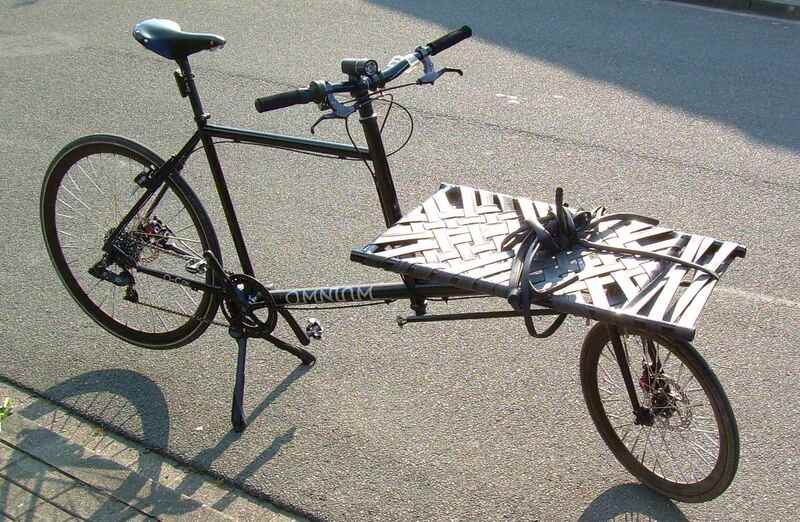 It was made for a large volume selling chain store dealing in bicycles (couldn´t very well call it a cycle chain store, could I) who fished for bargain hunting customers with the big names on the bike, but nonetheless managed to produce an unrideable (as in undrinkable, opposed to non potable) vehicle. First, in order to attain their price point, they saved a lot on labour, throwing the thing together in a way which allowed me hardly to leave anything untouched. 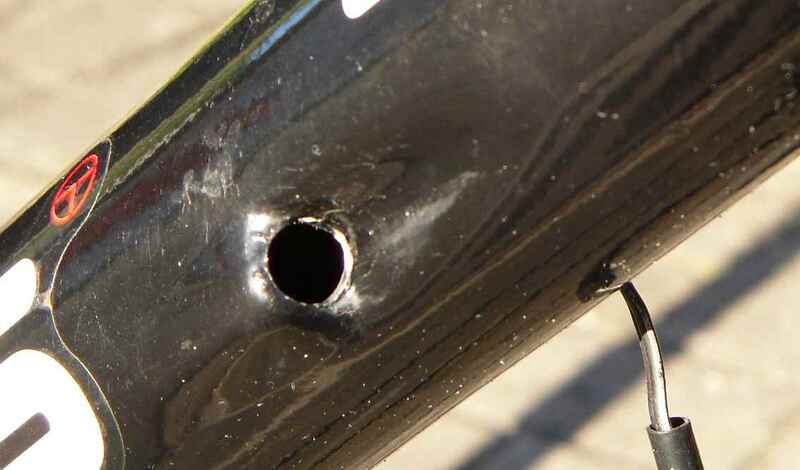 Rain water would enter without any problem, and standing the bike on the handlebars after a few rainy rides would have water gushing out of several of these holes. The hole had sharp edges, too. 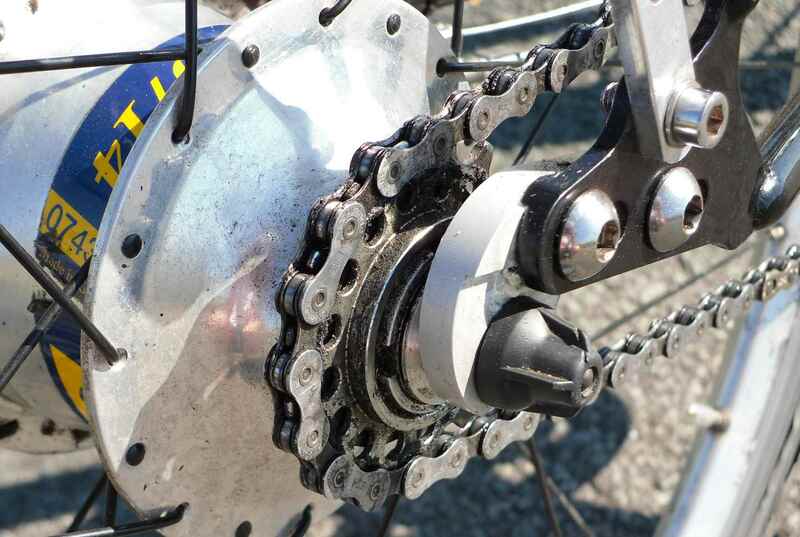 The chain was so badly aligned that there would be a constant noise from the rear sprocket. Both left and right hand chain stays had a thread each underneath for the Rohloff cable stop. 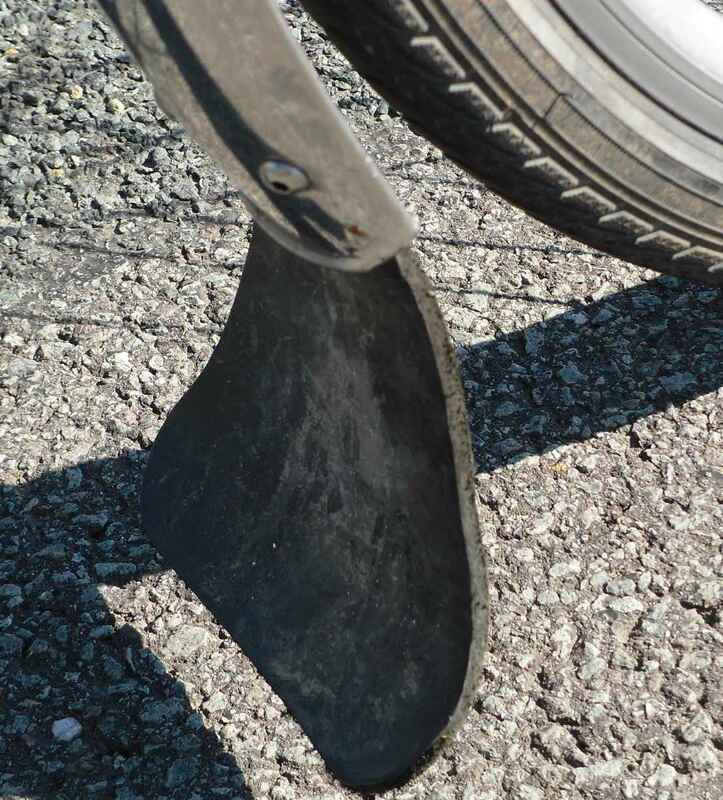 The fashionably short front mudguard was that fashionable that dirt would be thrown up everywhere when cycling in averse weather conditions. 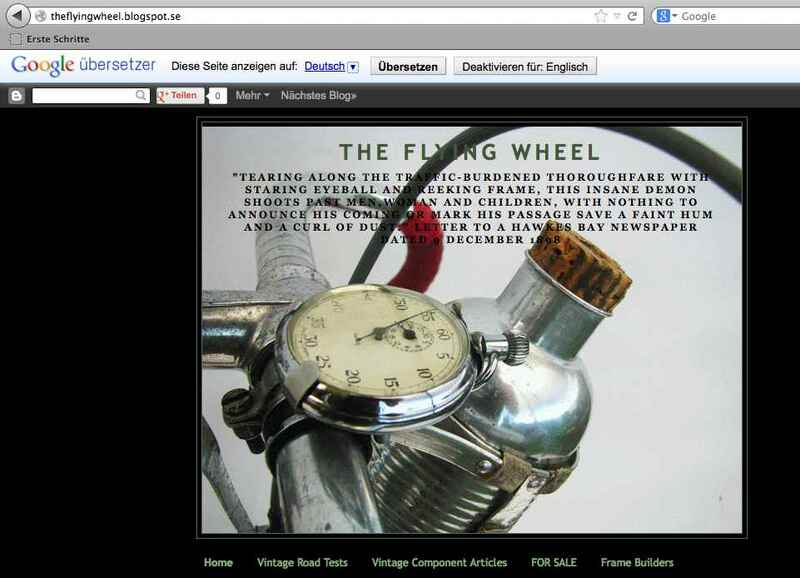 I swapped it at once for a stainless ´guard I had taken off a fifties bike as being unoriginal. So the bike had been ridden a max of 50 miles by its first owner; small wonder. 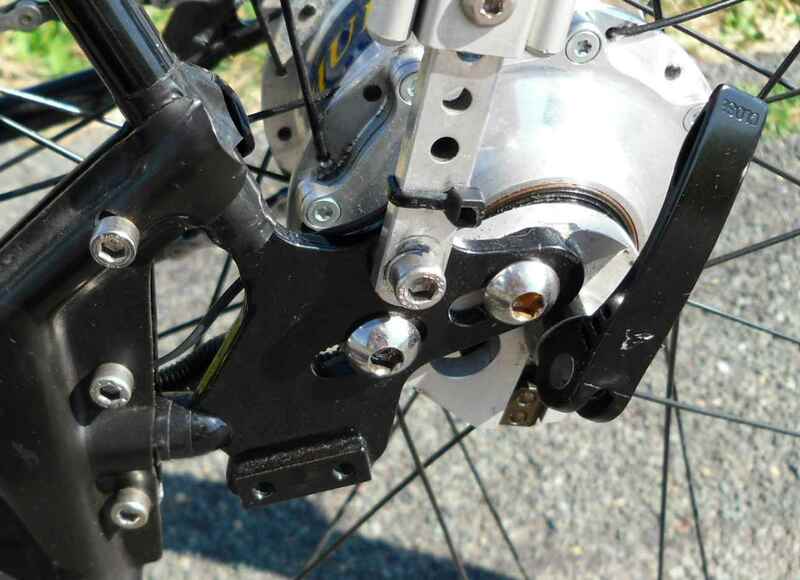 You could tell looking at the rim brake surfaces, brake blocks or those nooks and crannies on a modern bike you can´t get dirt out of if you life depended on it. 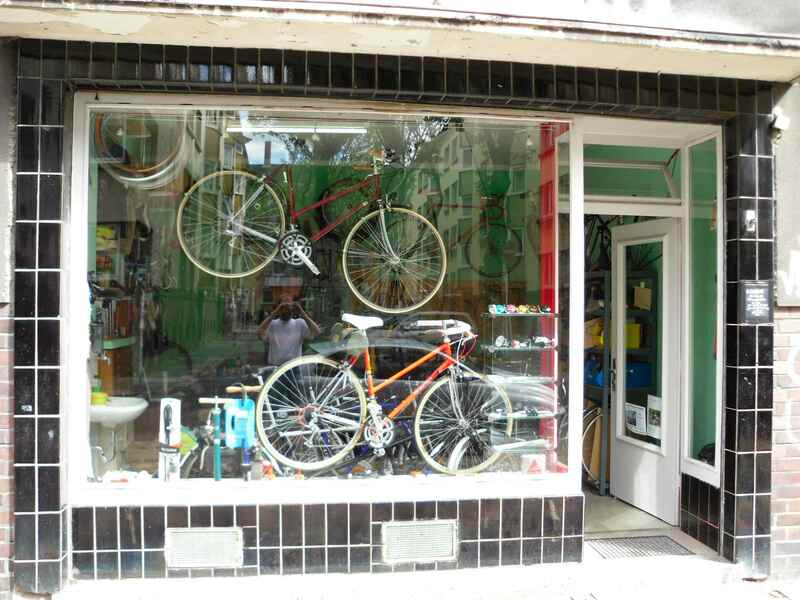 After five years the first owner just wanted to get rid of the bike and next, so did the bike shop: It was October. We agreed on a price which was considerably less than what you usually pay for a used Rohloff hub alone, my plan being to ride the bike over the winter, then break it for its more expensive parts, sell them at a profit and junk the rest, unless I liked my first Rohloff 14sp hub, in which case I would try to get a decent frame. So the first part of my system test had been successful: How cheap can you get a Rohloff equipped bike? Very. It had taken the best part of 15 years, but still. 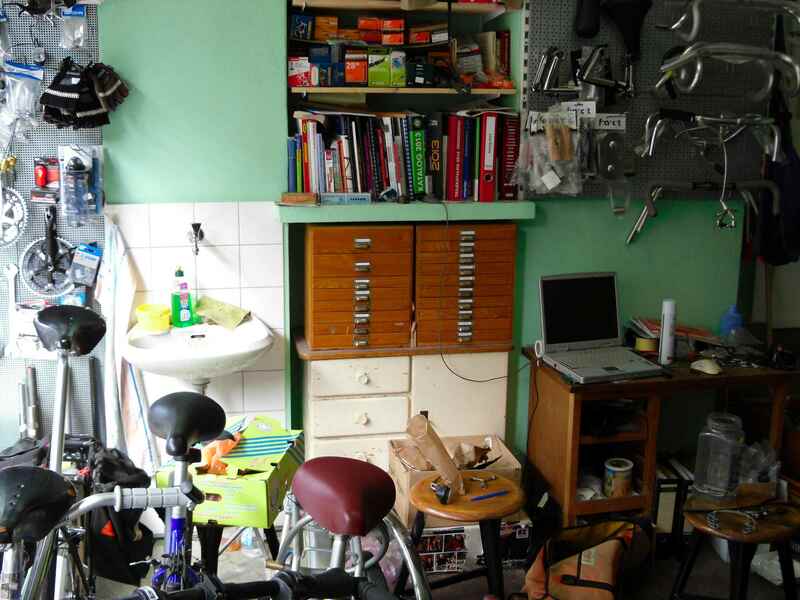 The next part of the test was: Can you make a good bike out of a chain store cheapo? 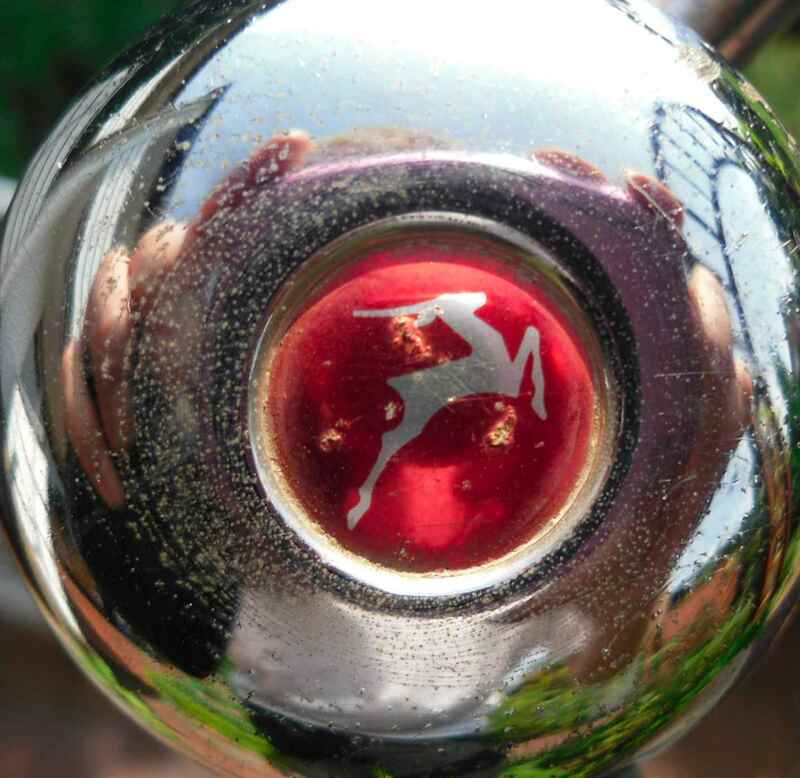 After a Saturday afternoon´s worth of wrenching and a few hundred kilometers the answer was No. 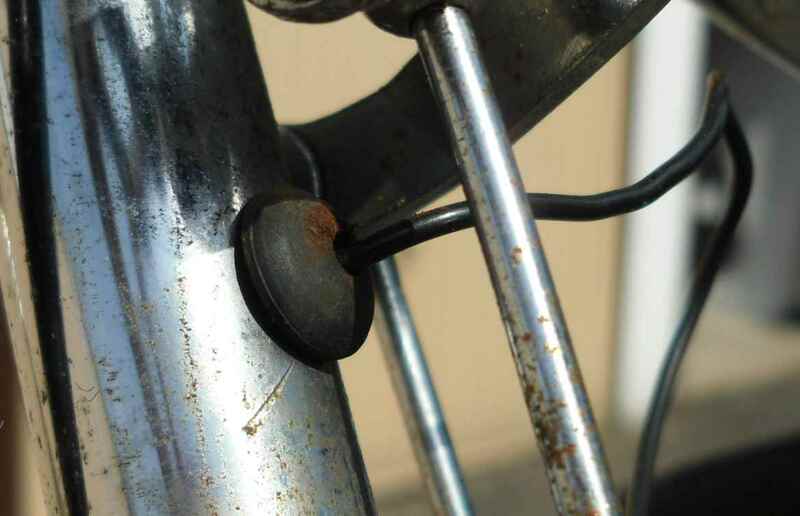 I had replaced the carrier rack with one from my used spares box, and the seat pin had been swapped out for a non-sprung one, plus a good Brooks Conquest, also from my box, but no way. I kept riding the bike regardless because I must admit that the Rohloff and the modern Maguras grew on me very quickly. 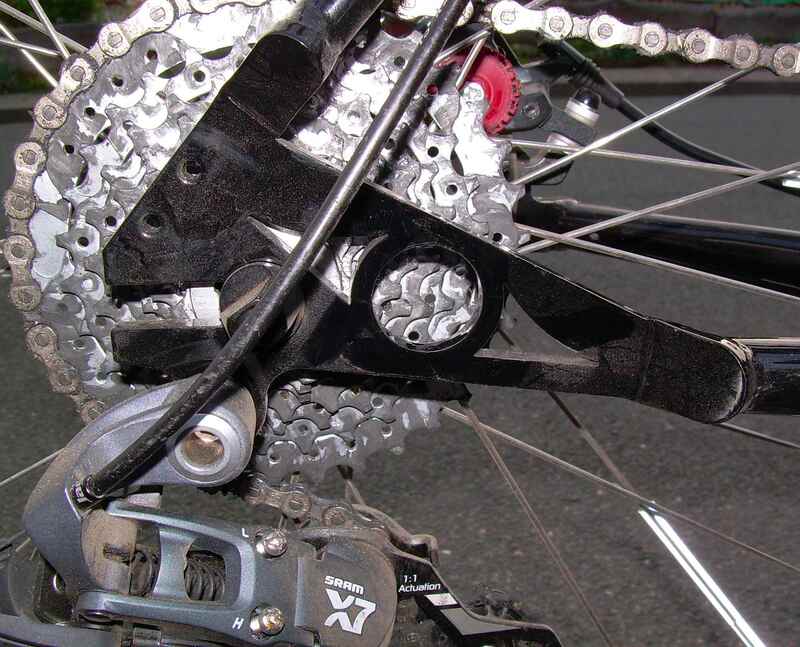 I like hub gears, always have, and this one must be the zenith of them all. 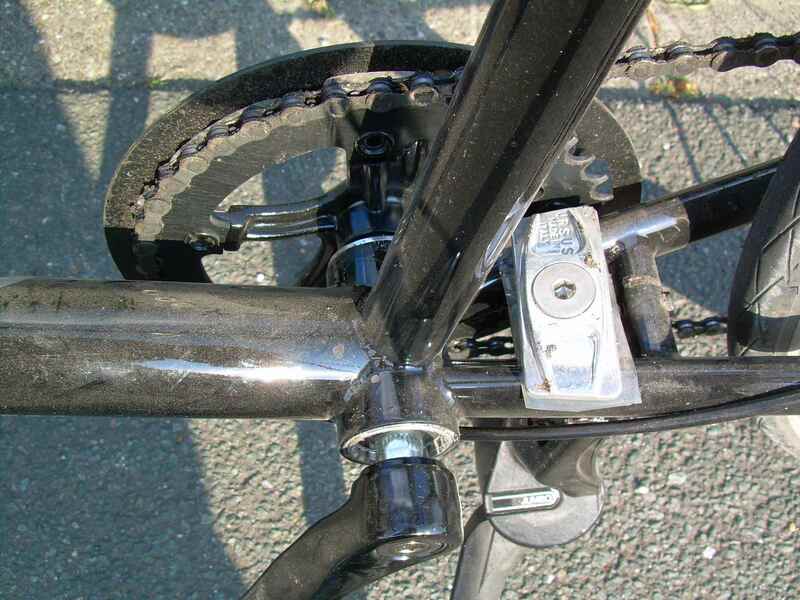 Contrary to what some people say I find changing gears easy (the secret seems to be to leave the cables rather slack), and the noise and vibration the lower half of the gears emit can also be greatly reduced when a steel frame is used. Sure, the energy needed to produce the noise and vibration felt through the soles of my shoes must come from somewhere, and on a bike there is only one source of energy, but the hub gear concept is neat and clean, and I like that. 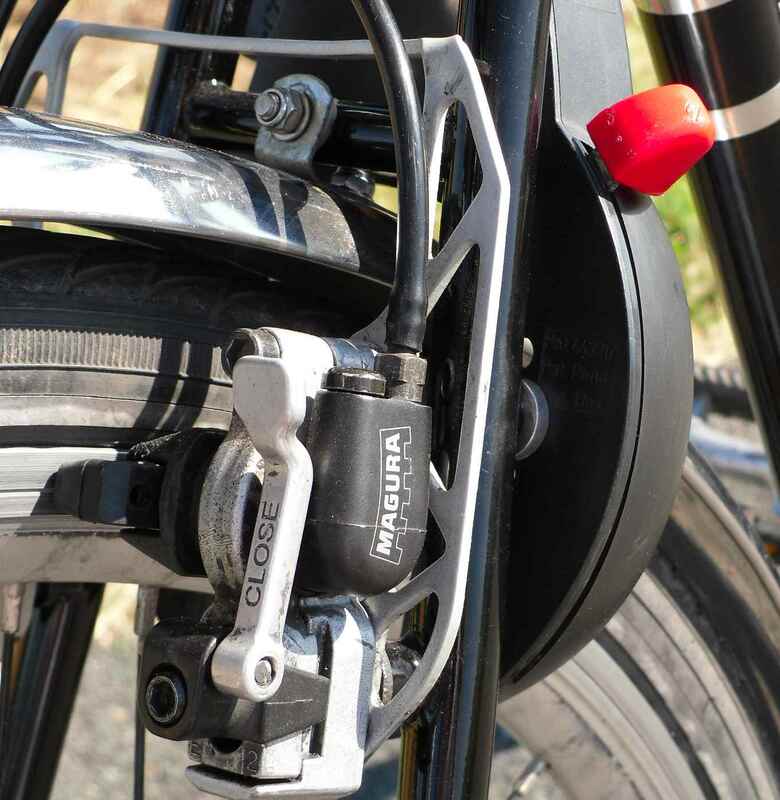 On the whole, I´m not becoming one of those Rohloff addicts, or disciples, or whatever you want to call them, but for me, the hub´s shortcomings do not outweigh its advantages. 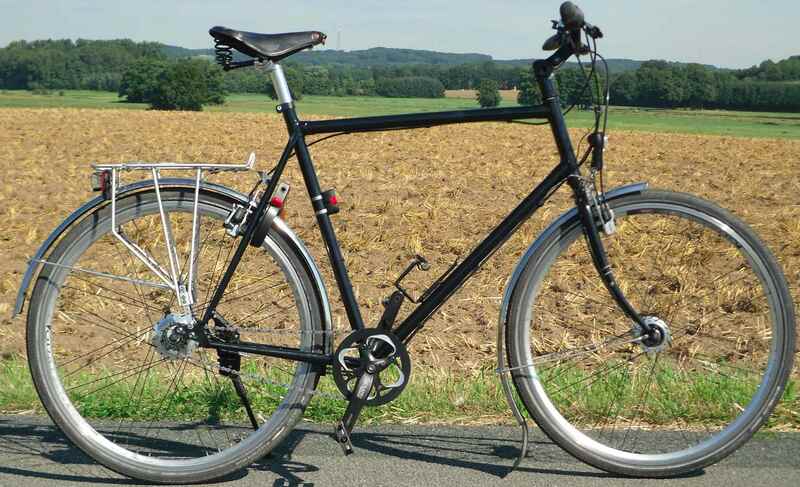 I decided to get a good, hard wearing and not too fancy frame about half way through this year´s very long winter, so the next part of the system test followed: Sourcing a lugged steel frame in 65cm c/t with Rohloff OEM dropouts. I don´t like the excenter method of chain tensioning, neither can I stand the long torque arm or an external switching box. 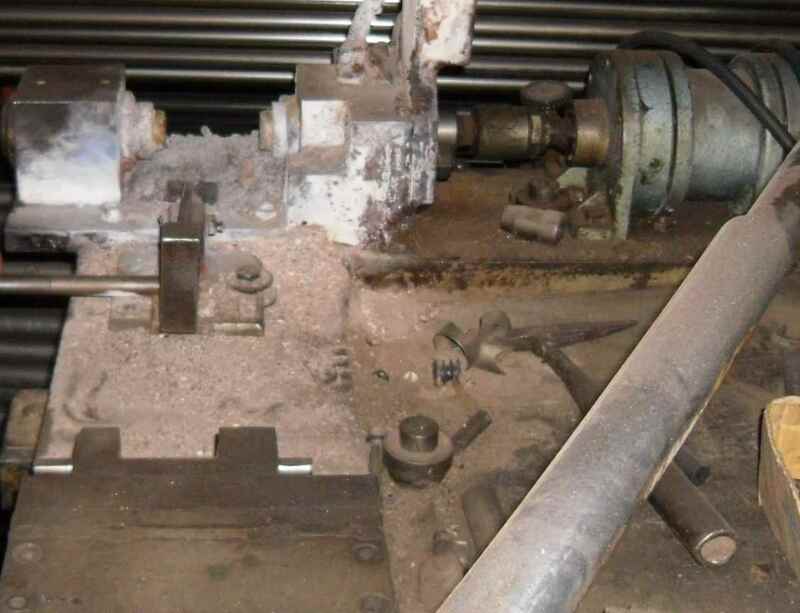 Neatness, that´s the hub gear principle. No problem if you want to spend a couple of grand, a number of frame builders will be pleased to oblige. 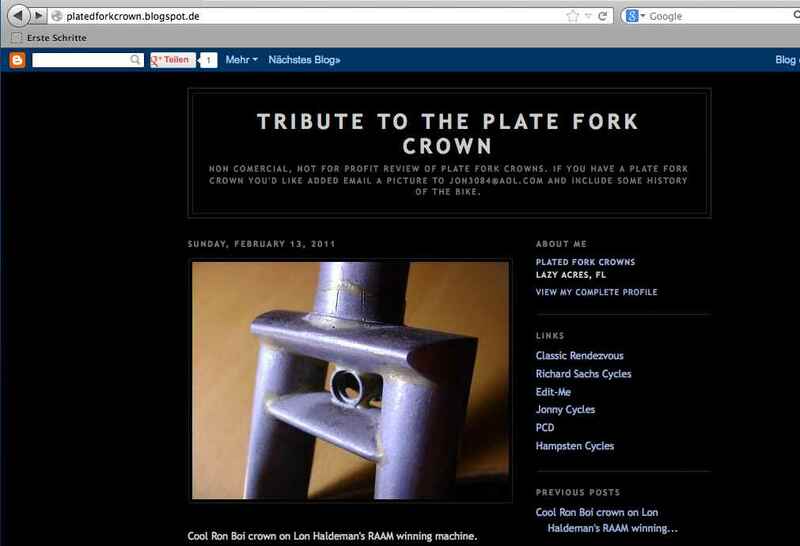 There are beautiful OEM dropouts available, but they all have their prices of course. I had nearly given up, the system failure seemingly not allowing me to get a decent, but un-fancy and un-hype-name Rohloff bike going. 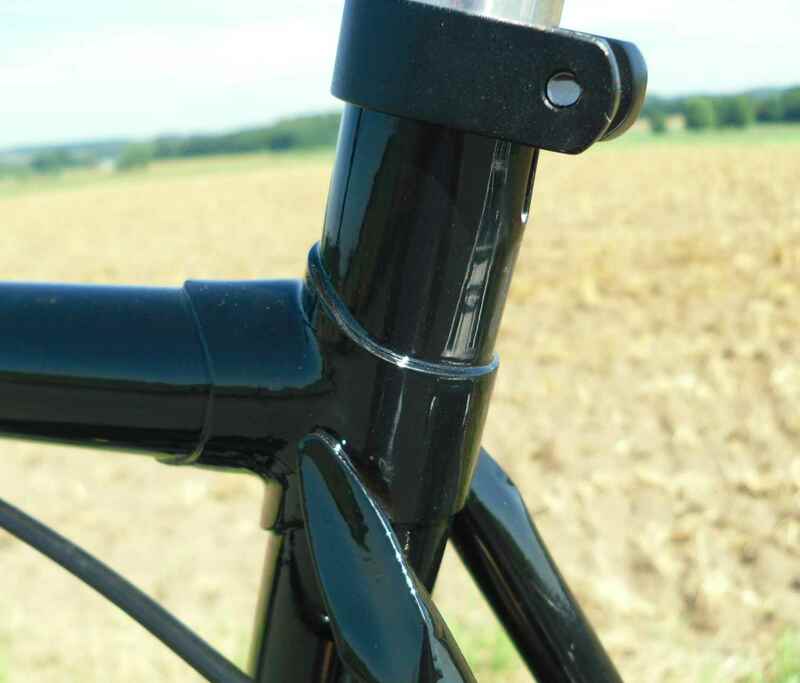 Note this, my budget for the frame/fork was up to 500 Euros, which to my mind isn´t nothing. So I had all but made my mind up to break the bike, squirrel the Rohloff away and recoup as much as possible of my money through selling the rest. 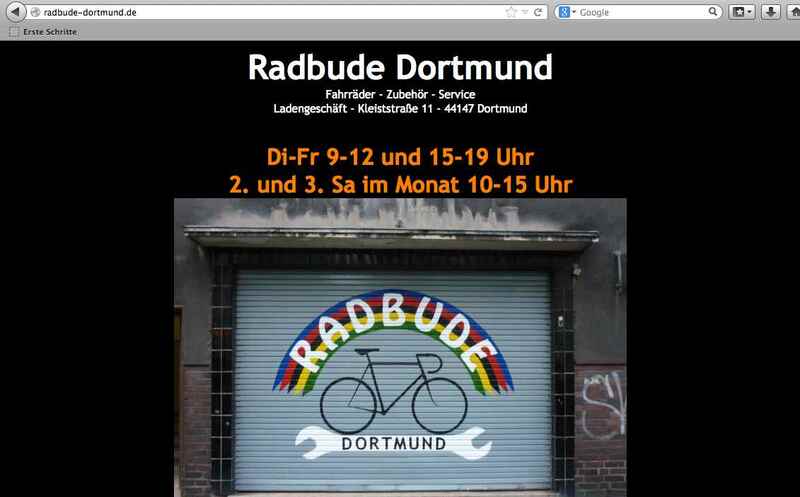 This was when the system´s saving grace in the form of freshly opened Dortmund cycle shop Radbude showed up. Tobit Linke, its owner, not only knows that steel can be a very feasibe frame material (he tried on PBP, among other long rides), but he also was willing to spend some time looking for a frame which would suit me. 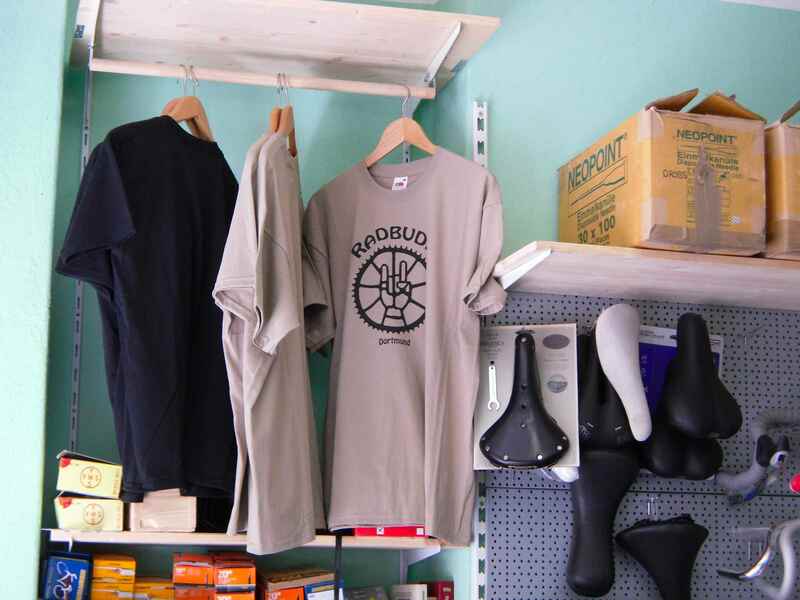 He has a lot of interesting stuff you won´t easily come across in your run of the mill bikeshop and caters for the enlightened cyclist who is willing to spend a quid more. It was the third try which scored, and I ordered a new off the peg bike frame, something I hadn´t done in about 25 years. Lugged, oversize tubing, shiny black, no transfers or stickers of any kind. Well made, in the heavy German tradition, just what I wanted. After a while it arrived, and off I went to Dortmund with the cheapo bike in the boot, to have Tobit swap round the parts. He had to show me the ropes with the Maguras as well as with the Rohloff, both being firsts for me, so there was some work in it for him, too. 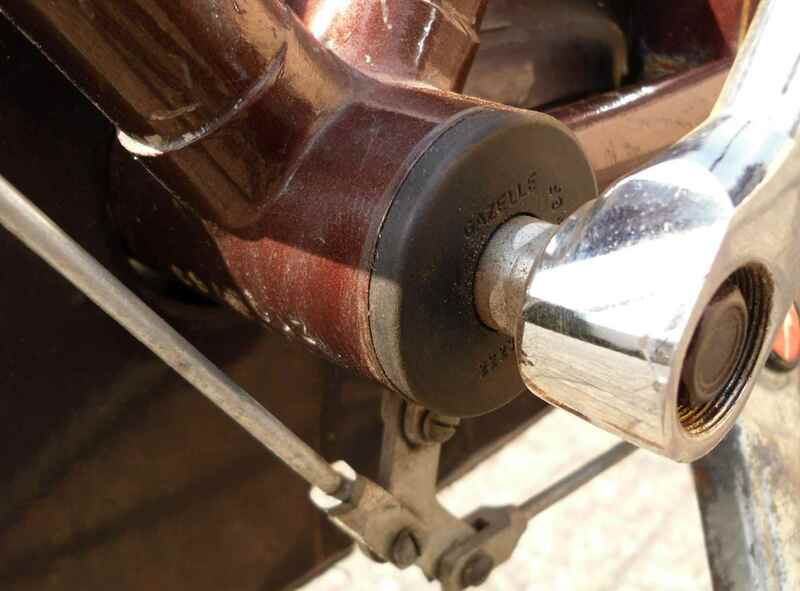 We also reused the bottom bracket/crank and the handlebar/extension assemblies from the cheapo. After we had done this, I proudly went home to assemble the rest of the bike. I even found a 30mm seat pin in my box, but then disaster struck. 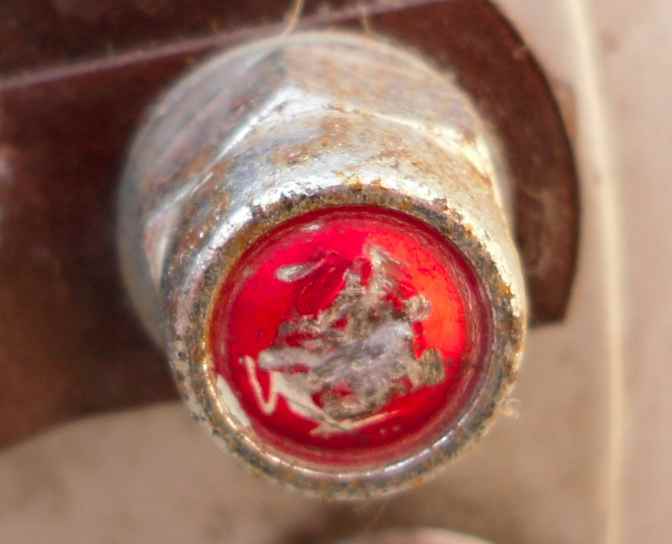 I have been re-using used stainless bolts all my bike wrenching life, which is close on 30 years now, without a hitch, but the cheap chain store bike had one last nasty surprise for me. 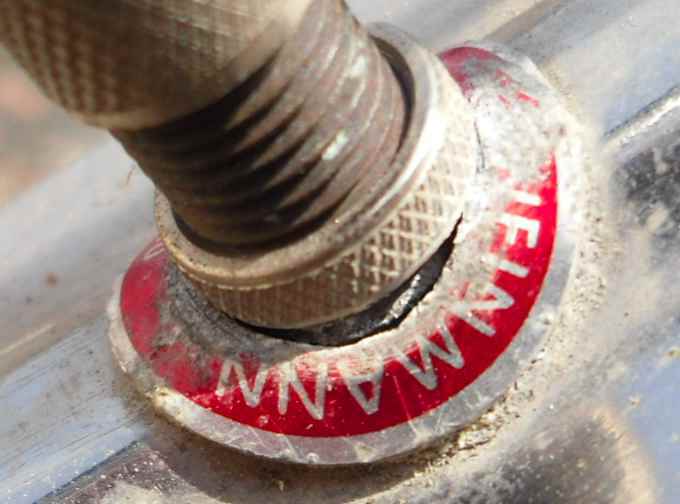 When trying to mount the rear mudguard, a stainless screw just gave when its thread was halfway down the thread in the frame, the head coming off without any effort at all. Tobit later told me that this is not an infrequent occurrence when working on cheap bikes, so I assume I have been pampered, missing out on all of these nasties. 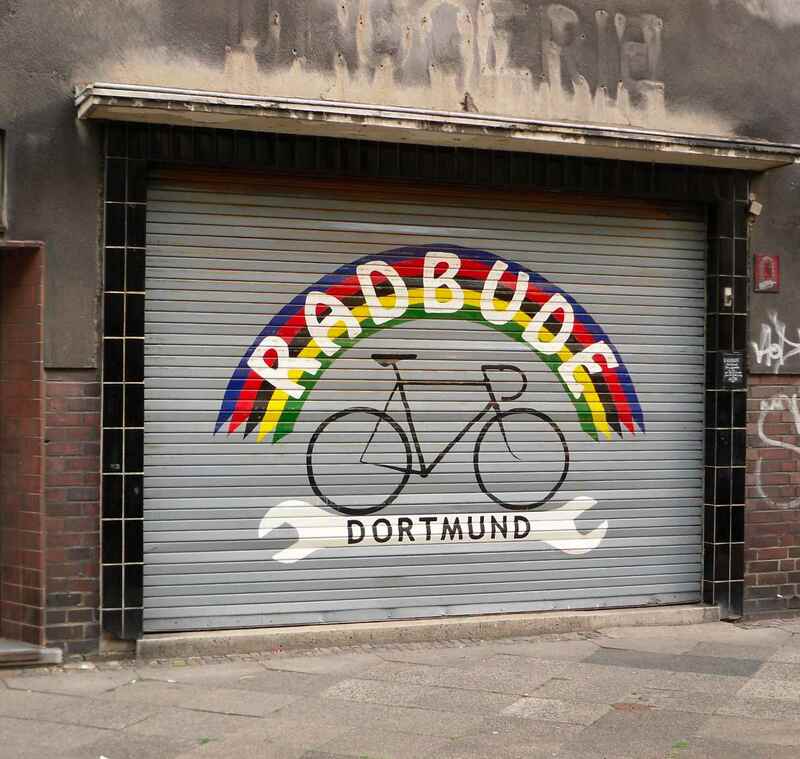 Anyway, off I went to Dortmund again, very much p/o, to have the offending half of the bolt drilled out or otherwise dealt with, and asked Tobit to finish the bike, which he did, using some rather clever tricks. I usually take pride in being able to do 95 per cent of the work necessary to keep me going on the bike, including wheelbuilding for my randonneurs, so having someone build my bike was new to me. 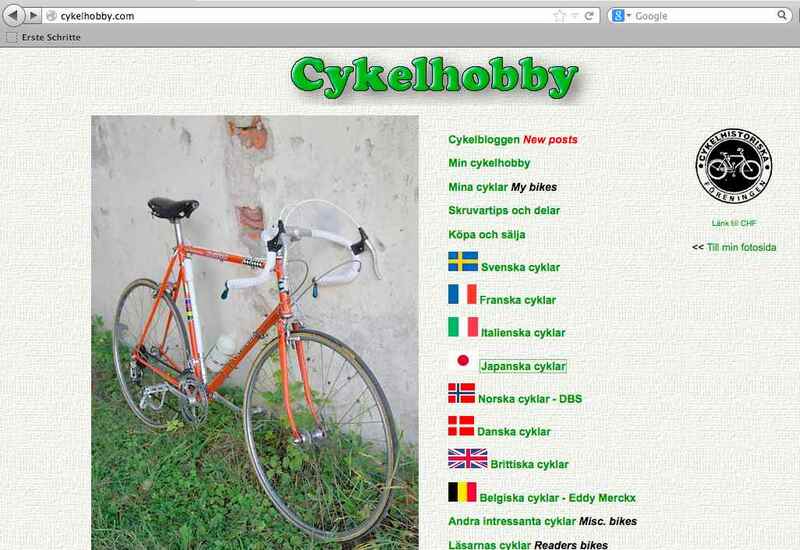 Of course, there were things left to do like locks, the bottle cage, speedo, some brake fine tuning after the new blocks had settled in and other stuff Tobit couldn´t know about, so I still can say that the bike has been partially built by myself. 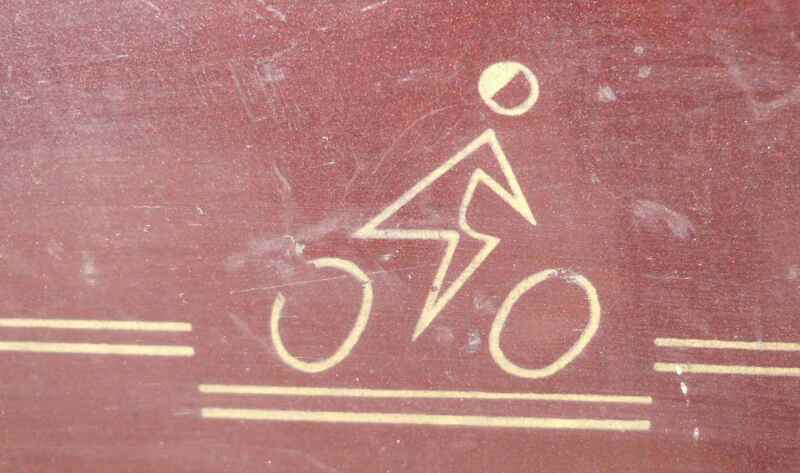 So, after all this, what does the bike look like? Here are some snaps. 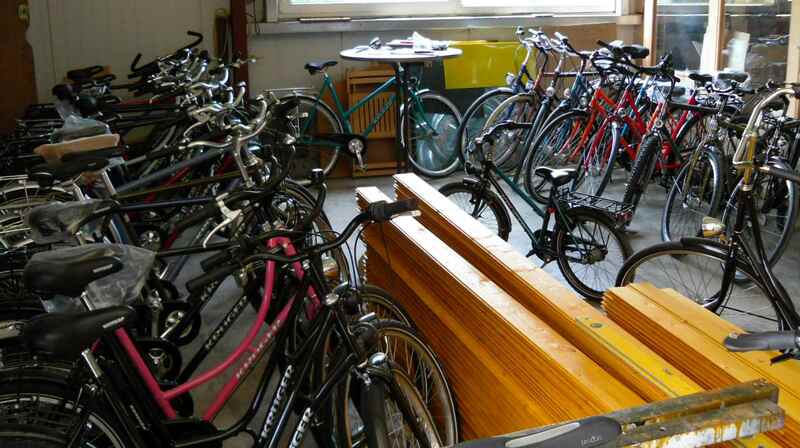 The frame was obtained through a wholesaler from Krüger, a manufacturer situated near Bielefeld, who mostly caters for the cycle industry. I am trying to get an appointment at the workshop and will report if it works out. The frame seems to be well made, rugged, and not overly refined, but the price is very good, and the frame seems to be well worth its money. 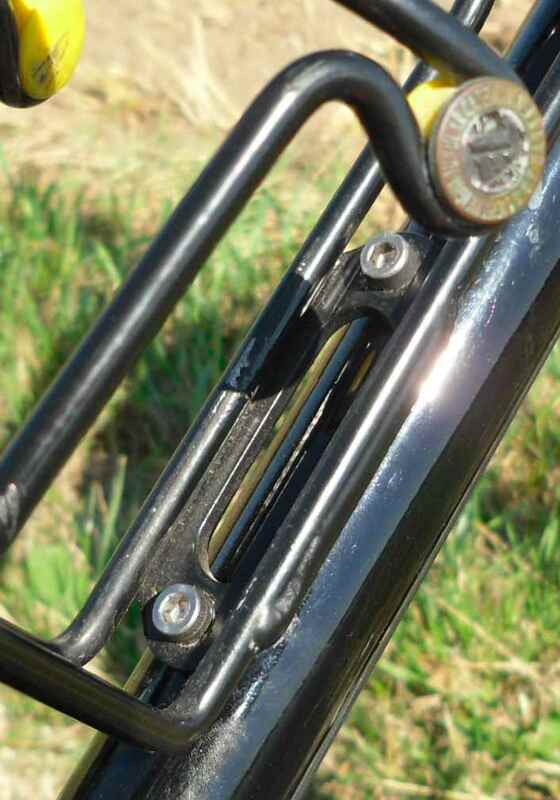 There are loads of useful braze ons, and hardly anything has to be banded on, which is great. 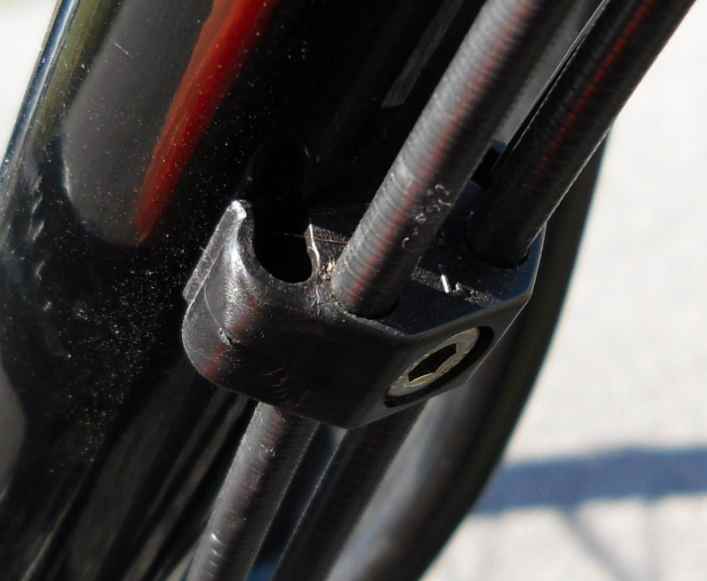 One thing I don´t like are the kick stand threads on the left hand side dropouts. I can´t help thinking what happens if the droput is bent. That´s why I used the standard stand from the cheapo. The ride is surprisingly lively, and I have not succeeded in inducing front end shimmy, which is something. The bike feels quick at low speeds, and I hope that once the tank track like Marathon Plus tires are replaced by something lighter and more responsive, it will be at high speeds too. 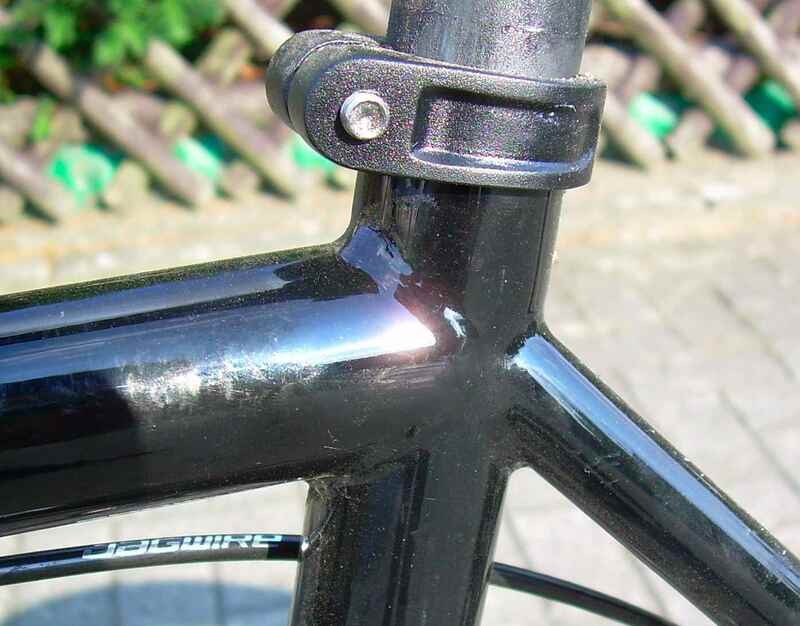 I would have preferred a more traditional geometry, but the slope in the top tube is not too bad and the Rohloff OEM dropouts make for steep seat stay angles anyway; something which can´t be easily helped. I like the large diameter cable eyes under the top tube and the fork; they easily accomodate Magura pipes and all sorts of other stuff. With the system test completed, I hope I will be riding this bike for a long time. 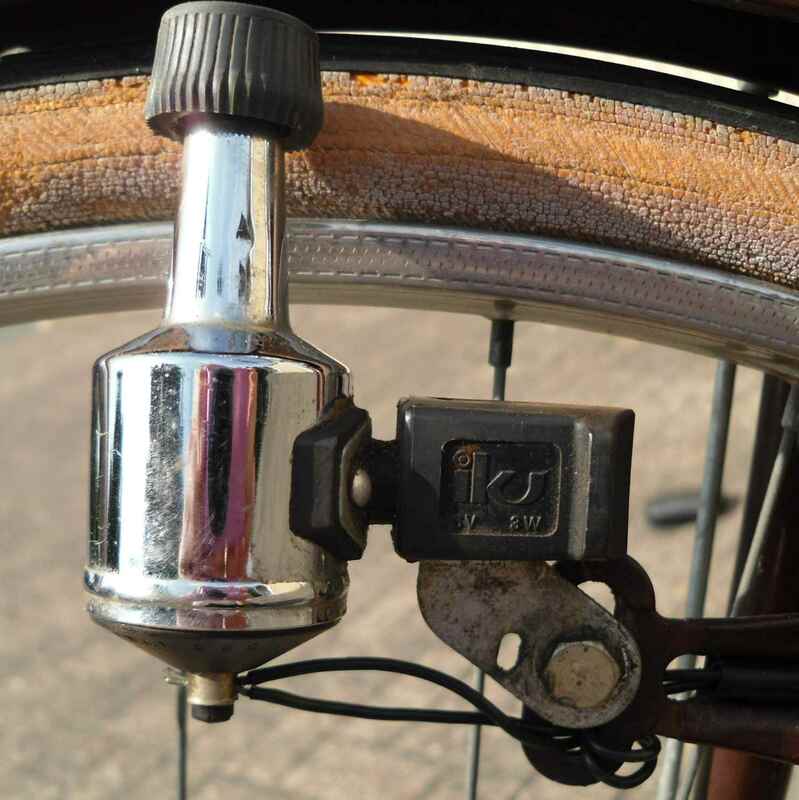 However, there´s possibly one more stage to the test: Is it possible again, after many decades, to have a bike with all German main componets today? 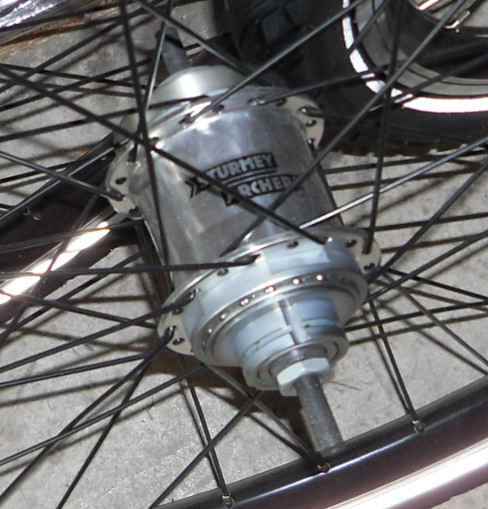 Once the rims will have worn out or the strange spoke pattern will have given rise to problems, I will replace the Shimano dynamo hub with a Son. I also could put in a German made bottom bracket bearing and a carrier rack. So let´s see what happens next. 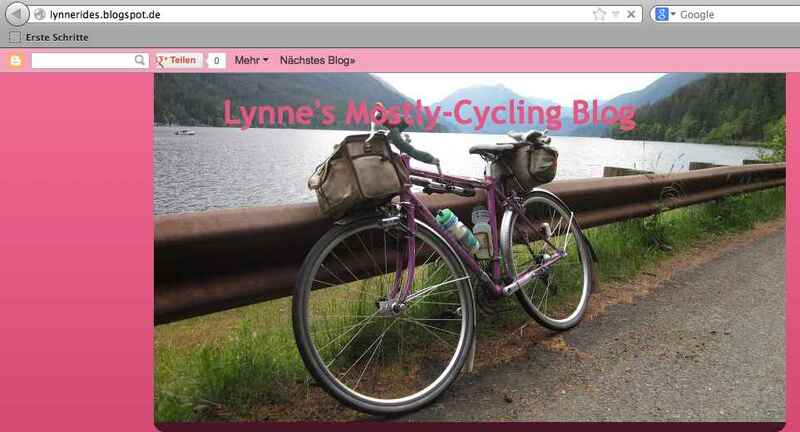 After a long summer break and also this being my one hundredth post I have been thinking I might have a look round at what other cycle blogs and websites there are. There are literally thousands of us who blog on their favourite pastime, so if there is anyone who would like to be included in (or, indeed, deleted from) the list to follow, please let me know. 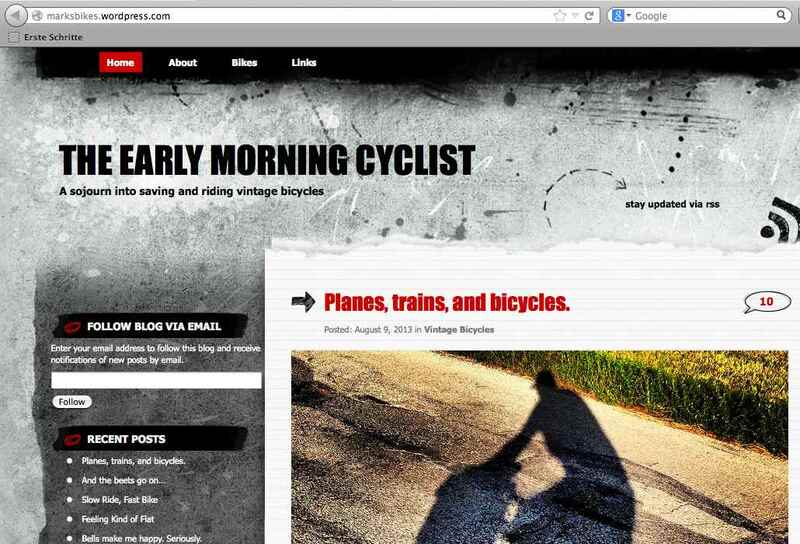 I have just picked a few of those sites I read frequently, or should, and, unless you know them already, will leave it to you to discover them. So there will be not many remarks from me, just screenshots to whet your appetite. Also if there are any blogs left unmentioned this does not mean I don´t like them, it´s probably just that I haven´t heard of them. 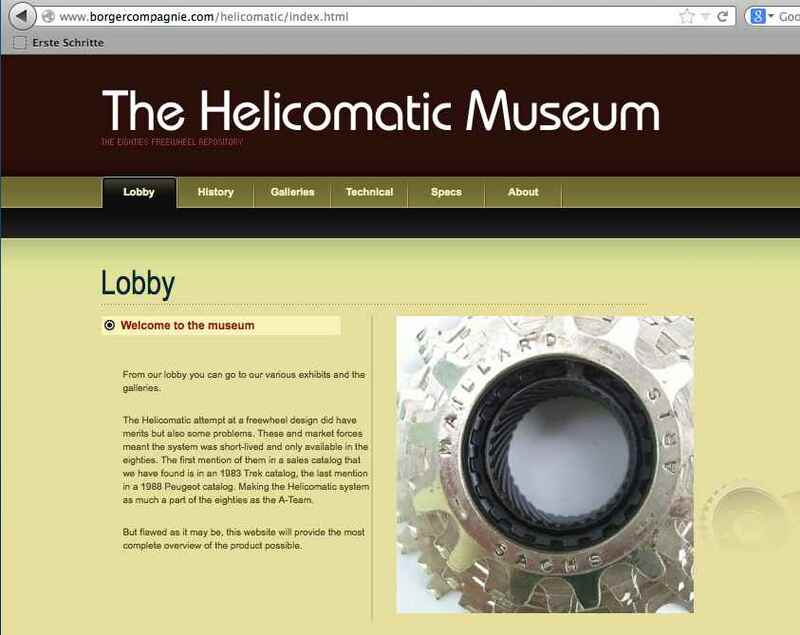 I have left out most of the giants like classiclightweights, classicrendezvous, its mailing list, and Jan Heine´s or Sheldon Brown´s sites, because we know them all anyway. Although there are no hyperlinks involved in this, let me add that I cannot be held responsible for the contents of the pages mentioned below, or anywhere else in my blog. First, of course, here is the biggest of them all, at least in Germany. 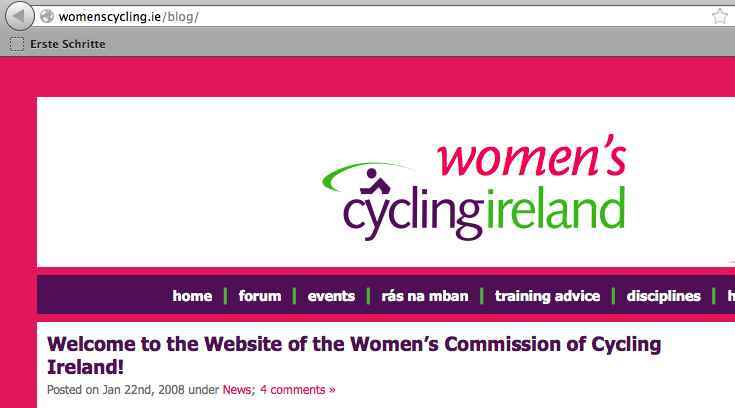 I still get loads of referrals from one mention of this blog about a year ago. Next, there is a blog run by two people I used to exchange a lot of emails with and who are among the most friendly types imaginable. Now, a run of screenshots which stand on their own. 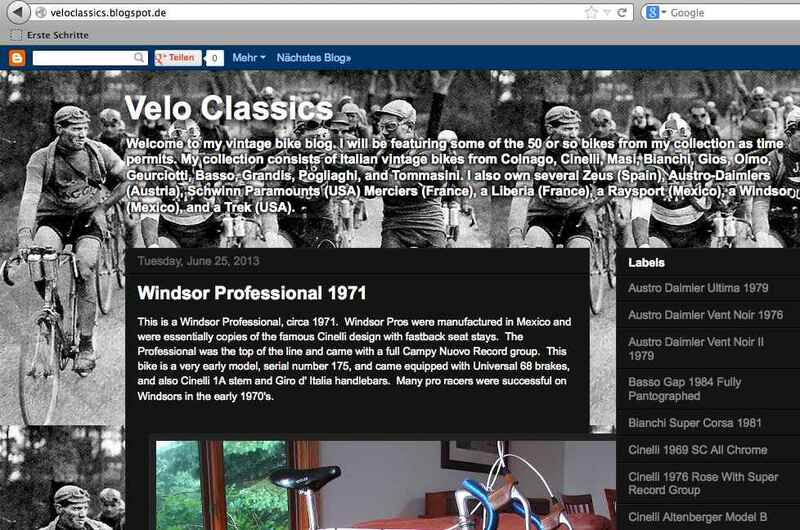 The first one must not be confused with the firm dealing in vintage bicycles and parts, velo-classic. 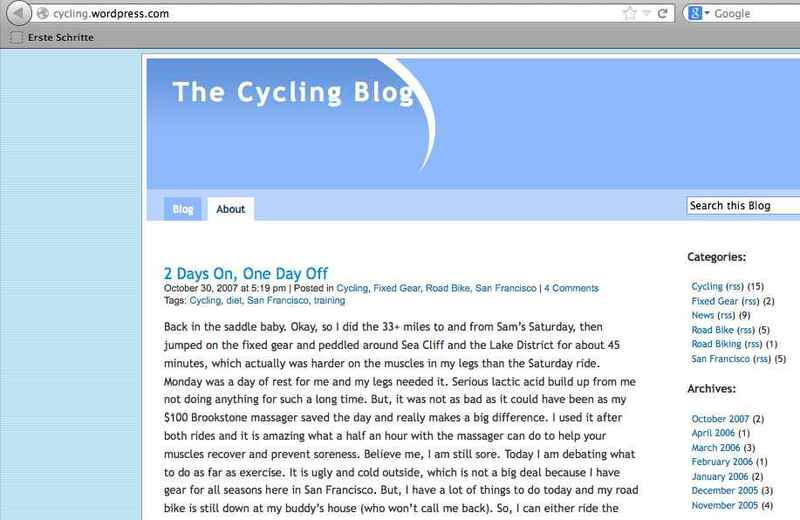 The following blog/website has a huge link list which is very helpful, and in general is quite amazing. One soon finds out that English and Swedish aren´t all that distant. The Schürmann family are responsible for many of Germany`s tracks. Their website is great. 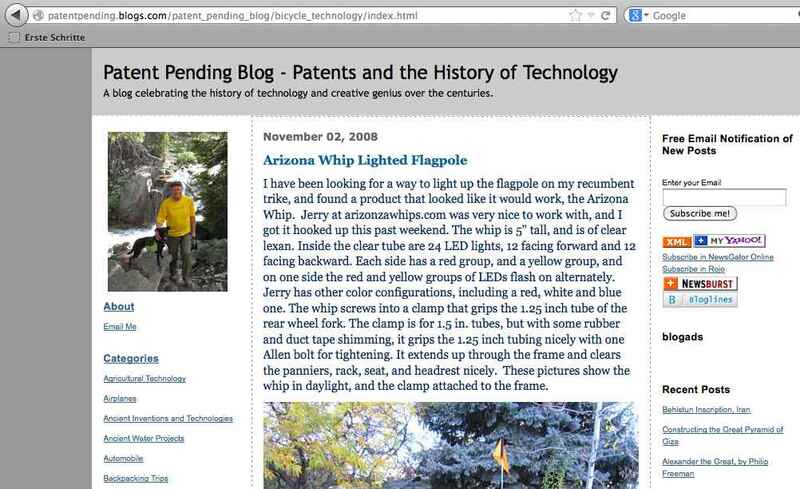 Next there are two blogs which have, for all intents and purposes, been discontinued. I mention the Irish one because I wonder how many readers it could possibly have had to begin with, and the other one because of its name. Now some websites of firms none of which I have any commercial interest in. The first one has been mentioned prominently in my blog on several occasions, so I just have to include it. 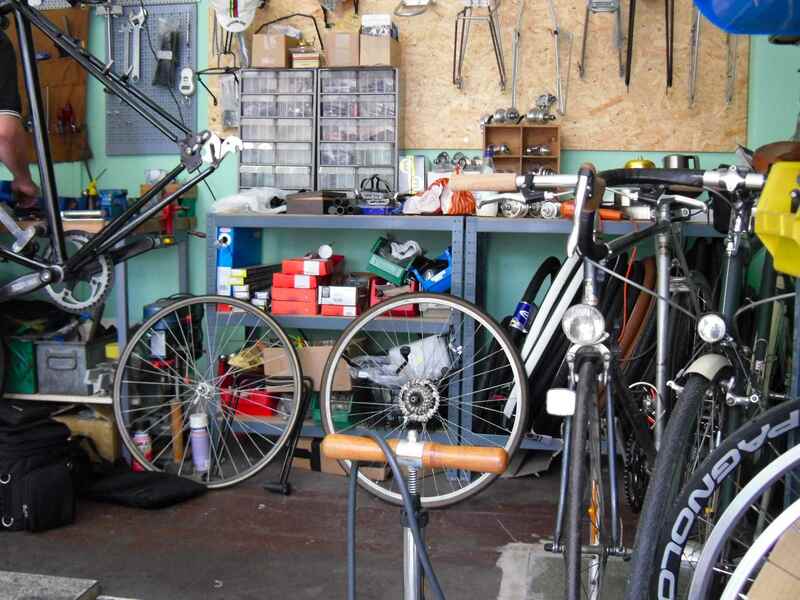 The next one is a small cyle shop in the neighbouring city of Dortmund, just opened about six months ago, and while it is small, with capital letters (17 square meters), the owner not only is a capable cycle mechanic but also a PBP participant. There will be more on the shop in my blog soon. 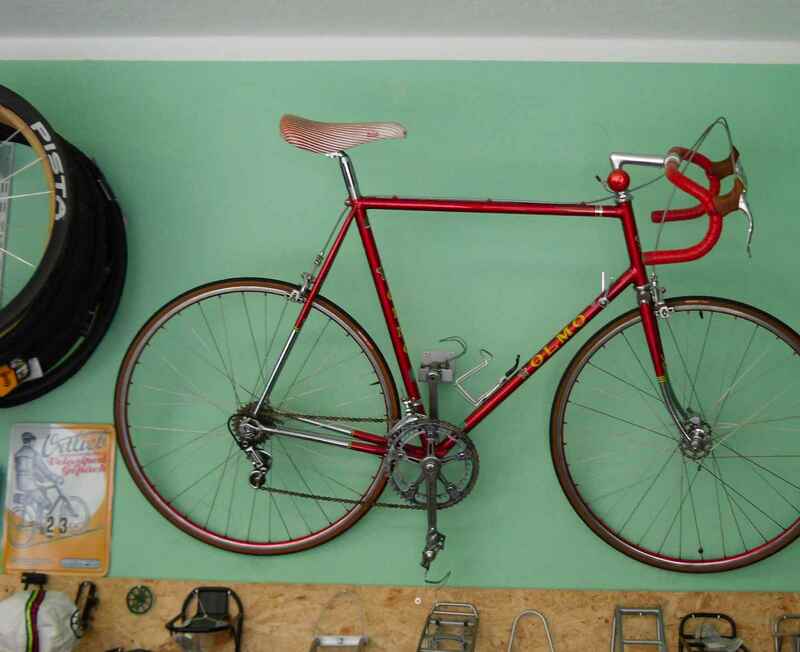 This one isn´t a shop really, but a very able frame builder. It´s definitively worth a visit. Strictly speaking, this doesn´t belong here at all, but what the. 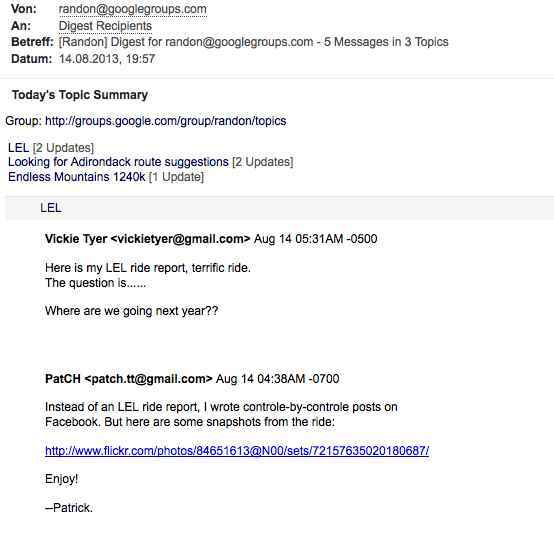 It´s a good old mailing list, no hyperventilating forum. Here people sign off with their real names, and leave much useful info. 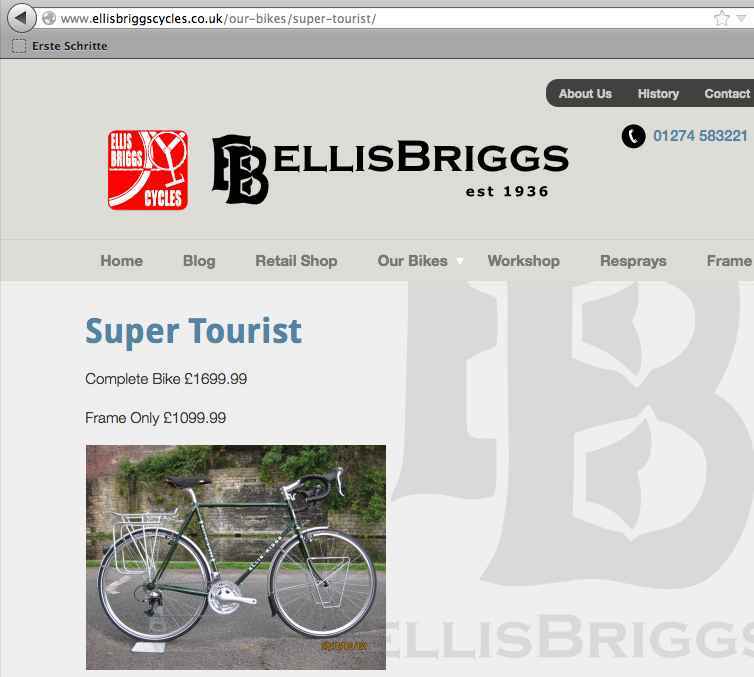 Lastly, here is a cycle manufacturer known only to very few people. I hope to be able to report on the firm in the near future, as I recently bought a rather special frame they made. I don´t know if this is reassuring or disturbing, but I have yet to see a blog design which can convince me to leave my Sandbox.